Hello there! We have more fabulous inspiration to share with you here on the blog today. I’ve been having fun with the new dragonflies from Visible Image! As there are now new smaller ones, the set is so versatile. This card uses the acrylic block technique as a background with some dragonflies stamped and embossed with white embossing powder. The ink used is Color Burst. I love the intense colour that this product has! The words are also stamped with the same ink. After seeing/reading somewhere that you can spray your stamp lightly with water and mix colour onto the stamp with your finger, I decided to give it a go with the words. 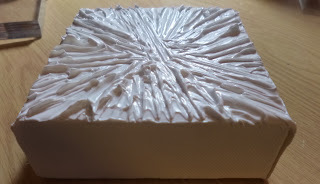 No different to what you do on the acrylic block…just using a stamp instead. The multi-tones that came out on the words was amazing!!! And as long as you don’t have it too wet, then the words are quite crisp. This is my final DT make for this year for Visible Image. You will find more of Dot’s inspiring projects over on her blog. Thanks again for visiting us today. Come back soon! How apt that this is the set that I chose to play with, I had previously made a set of backgrounds with Distress inks, spritzers and paints, and this was one of my least favourites, as I felt it was less than perfect, the ink hadn’t spread evenly across the sheet, making a mottled effect botttom left. However…. when I stamped the two scripty flowers onto separate pieces of coloured card, and cut them out, it all seemed to work. And I thought that the effect actually seemed….right! I used the bubble circle outlines and stamped and embossed with white, making it super easy to roughly fill them in with watercoloured distress ink. I used the same colour to stamp the other full circles, to tie them together, and stamped random patterns round the edge of my design to add interest and highlights. Click these links to get to the Visible Image shop, The Visible Image Facebook page, and the Facebook group where you can share your makes for a chance to WIN a voucher! We love this card ♡ Gorgeous background.. Thanks Nicky! Be sure to come back and visit us soon for more gorgeous inspiration from the team. And of course I just had to add some of the little moths too ^.^ They fit just perfect on those bottles! And some Crushed Skull… What could we brew with that? We will be back tomorrow with lots more inspiration for you. Today I’d like to share a new Visible Image Monolith. I used the brand new Angel stamp set. It is so so awesome!!! I used stencils from STAMPlorations together with Texture Paste on my background. I colored it with Gelatos. Some of the color was removed through the stencil with a wet baby wipe later. 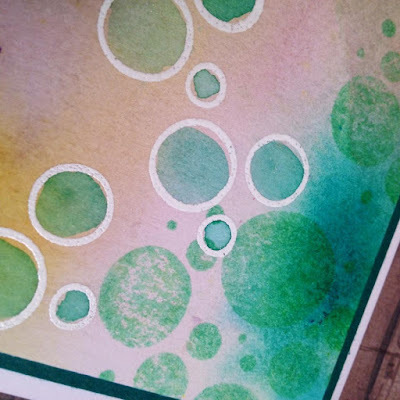 The white splatters are made with Vallejo liquid watercolor. The black angel is embossed with WOW! Black Glint Glitter. The metallic one is embossed with WOW! Bonding Powder and covered with Mica Flakes. Absolutely gorgeous! Doesn’t she look amazing in gold ♡ Thank you Susanne! We hope you are feeling inspired! Thanks for visiting us here on the Visible Image blog today. You will find our online shop HERE where you can get your hands on our amazing stamps and brilliant Monoliths! And if you have missed any of our latest posts you’ll find them HERE! Hope you’ll visit again soon. I thought it was about time I decorated another Visible Image Monolith, they are such fun to do, and there are endless possibilities. Glimmer of Light, plus the fabulous Rays of Light, and the Shine Bright set, you see the theme, lol ! And of course don’t forget the fabulous MDF, which come in a pack of 5…… Monoliths. 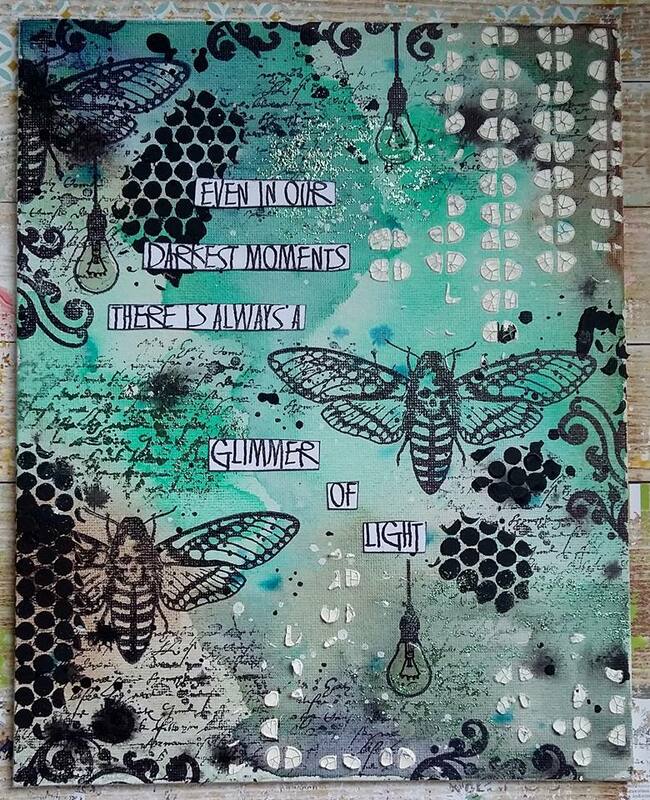 I used Dylusion Paints on the front, a Black base, then combination of colours on top, then stamped the Rays, using white Ink, where I wanted the little light bulbs to hang. 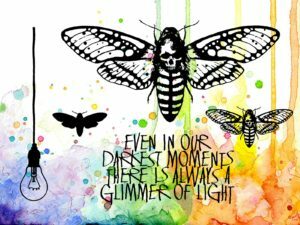 I then stamped the little bulbs and the sentiment in Black Versafine Ink, and heat embossed the wonderful Moth, onto card , coloured them in using Distress Inks, and fussy cut them all. I added glossy accents to the bulbs, and Stickles to the Moths. On the other side, again I painted the MDF in Black, added some paste through a stencil, and when it was dry, used Gilding wax to highlight it. I stamped the Ray into Acetate, and heat embossed it in Yellow powder, and the large light bulb, again onto acetate, and heat embossed in Black powder. I stamped some more small light bulbs using Black ink, coloured them and then fussy cut, glued them to the MDF, and used Glossy Accents. I hope I have given you a bit of inspiration on how to decorate the MDF Monoliths. We’ll be back soon with more awesome Design Team inspiration! Hi there! Thank you for coming to visit our blog today. We had a wonderful time and a much needed rest! We have so many amazing Design Team projects to share with you, so we will be catching up with lots of posts every day for the foreseeable future, as we don’t want to miss out on any of them! It’s my turn to share some creative Visible Image playtime. The kids are off from school and the time ran away from me a teeny bit. So, I wanted to make something simple and bright. Using some of my most favorite stamps and Inktense Color Blocks, I made some clean and simple notecards. I used the Flower INKognito and Butterfly INKognito Visible Image stamps. I applied the color block directly onto the stamps in various scribbles. when dry are very stable and permanent. The images are stamped onto watercolor paper I cut to size before stamping. Stamp away.. I could easily do tons of these and not get bored! Each one even using the same colors comes out unique. Thanks for looking and hope you can make a bit of time to play! Show & Tell Monthly Challenge.. your chance to WIN a £25 coupon! Facebook Group.. show us what you have been creating and join in the banter! Facebook PAGE.. don’t miss our awesome giveaways every Friday! Instagram.. so much gorgeous inspiration! And sign up to our Newsletter too! We will be back soon with an amazing project from Veerle Moreels. So, come back and visit us again soon to see more gorgeous inspiration from our wonderful team. Hi there! Thanks for visiting our blog today! Sorry for the lack of posts recently, we have just been inundated with orders for our Summer Release which is AMAZING! Thank you ♡ We are thrilled you are loving these new designs so much! I used washes of DecoArt Media acrylics to created my background: Cobalt Teal Hue, Cobalt Turquoise Hue, Dioxazine Purple, Burnt Umber, Pthalo Green Blue. I flicked some Carbon Black Media Mister onto the damp wash then allowed to dry. Once dry I flicked a bit more of the black Media Mister (to create more defined spots) and did the same with White Linen Dylusions spray ink. I wanted to add some texture, so used white DecoArt Media Crackle Paste and black DecoArt Modelling Paste with some stencils, and once again set aside to dry. 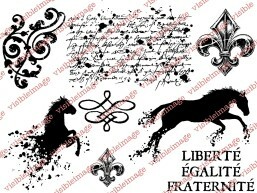 I used the script stamp and flourish from the Revolution set to add some background detail. I stamped them both with black Archival Ink, and then used the script stamp with Ranger Sticky embossing powder and turquoise foil. 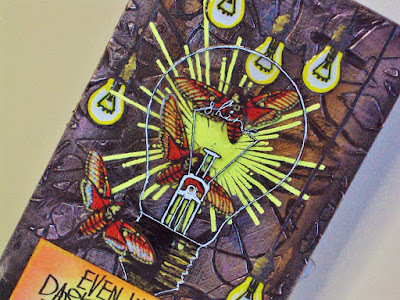 I stamped the moth and light bulb with Archival Ink and used Glossy Accents to highlight the glass bulb. Finally I stamped the sentiment onto white card and cut it out, edging the pieces with black ink. I hope that you enjoyed today’s project – be sure to come back next week to see more of the new release stamps in use!! Visible Image Facebook Page – weekly giveaways and latest news! 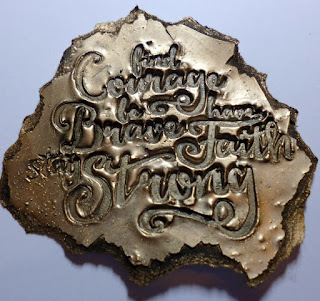 You will find more of Teresa’s awesome projects over on her blog. It is always so incredibly exciting to see the first Design Team creations with new stamps!!! Thanks for stopping by today, you can check out our whole summer release HERE! Hello there! Thanks for stopping by! We are excited to be back daily blogging again… sharing the wonderful cards and projects created by our awesome team every day of the week! Here I am with my latest project featuring the fabulous set by Visible Image. It´s my evergreen. So versatile and stunning. What is it? No Regrets Set. Four awesome quotes just perfect for anything…a card, a tag, some art journaling. Simply, a true must have. As its name says…you won´t regret buying it!! For more stunning stamps go here. You will find more of Denisa’s amazing creations over on her blog. We will be back later with today’s NEW stamps preview from our Summer 2016 Release! If you missed yesterday’s you will find it HERE! Thanks so much for visiting us today. Hello there! Thank you for coming to read our blog today! 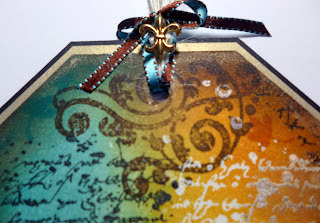 Denisa has created these gorgeous mixed media tags featuring our Flower INKognito stamp. 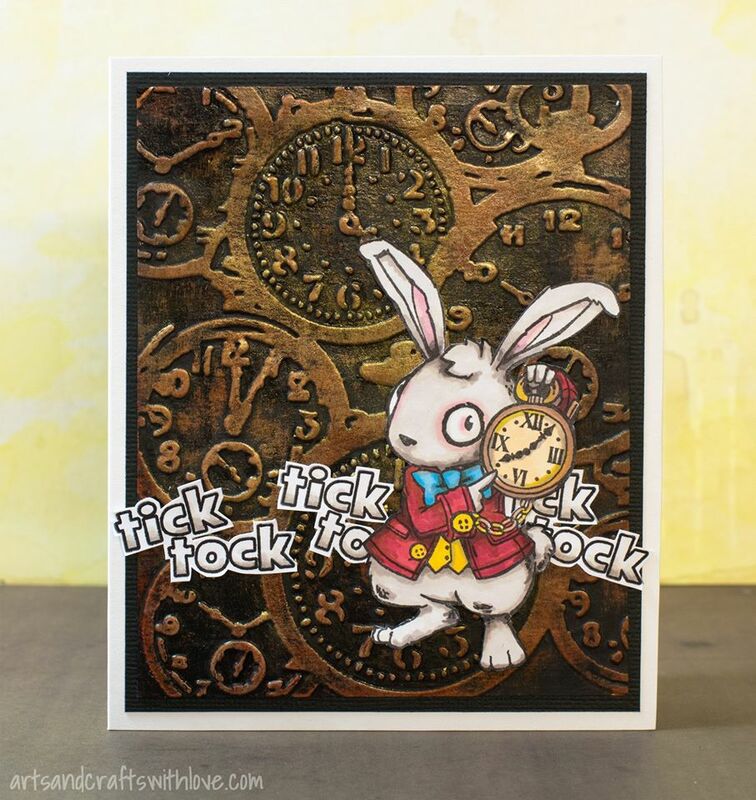 Elina has added our Wonderland White Rabbit stamp to her awesome mixed media background! to create her fantastic card. and added the perfect quote from our This Is Me stamp set. 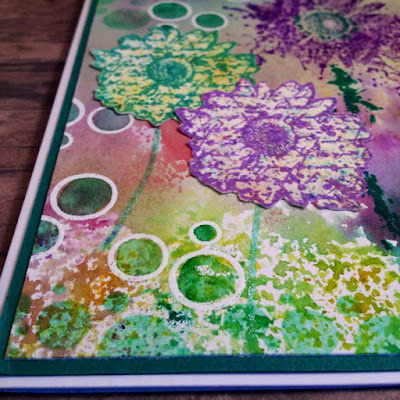 Susanne has featured our Feel The Beat stamp set on her amazing inky background. for our stunning Butterfly INKognito stamp set. We hope you are feeling inspired to get out your Visible Image stamps! Or maybe to pop some new ones into your basket! Don’t miss our weekly giveaways over on our Facebook Page every weekend! And… show us what YOU have created with our stamps over in our Facebook group ‘Show & Tell challenge’ where every month there’s the chance to WIN a £25 coupon to spend in our shop! We’ll be back soon with more gorgeous inspiration from the team. Hello there! Thank you so much for coming to visit our blog today! All week we have been running our Bonkers Wonderland offers!!! Thank you to everyone who has ordered so far.. we are so happy that you love these character stamp sets! Timeless characters you will love creating with, and each character comes with their own quote and accessory stamps too! If you haven’t ordered yours yet and would like some or all of these awesome sets, you need to hurry on over to our shop before these mad offers end tonight! We will be back next week with more fantastic projects from our very talented team. We have some wonderful inspiration to share with you today, created by our amazing Design Team. Whether you have already got your hands on some of our latest releases, or have them on your ‘wish list’, we are sure these awesome samples will make you want to get out your stamps and inks and PLAY! 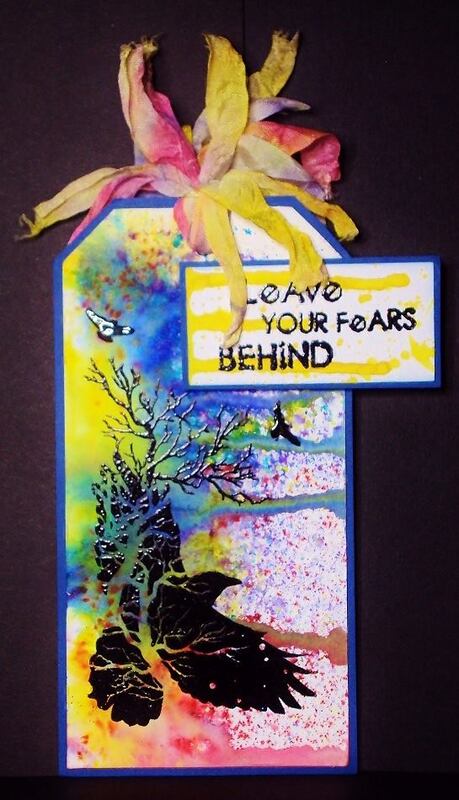 Teresa Morgan created this brilliant card with our awesome ‘Trust Your Madness‘ quote stamp, and Teresa has used our fantastic ‘Scratch The Surface‘ stamp in the background. You’ll find more details over on Teresa’s blog. 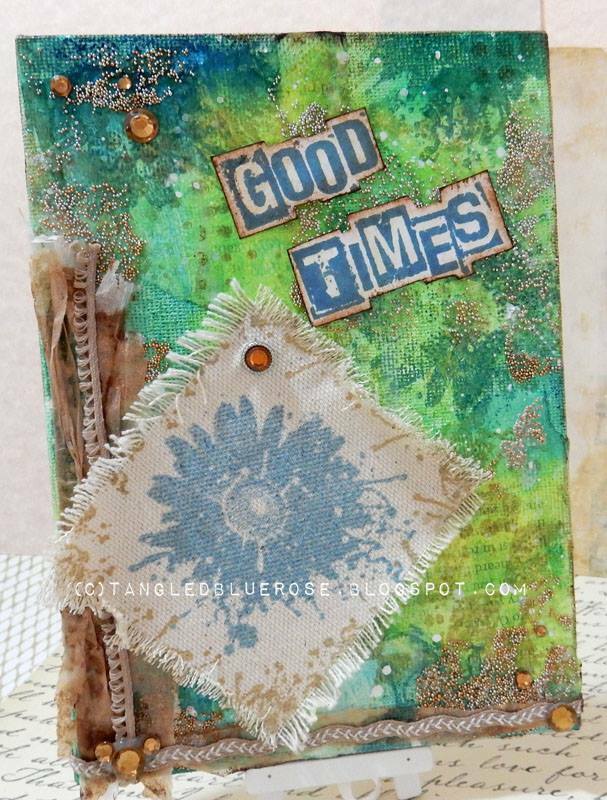 Sue Joseph created this awesome card using our ‘Teenage Kicks‘ stamp set! More details over on Sue’s blog. Wilma Voermans has created these awesome mixed media journal pages featuring our ‘Bite Me‘ stamp set. You’ll find a video tutorial over on Wilma’s blog showing how she created her wonderful texture! 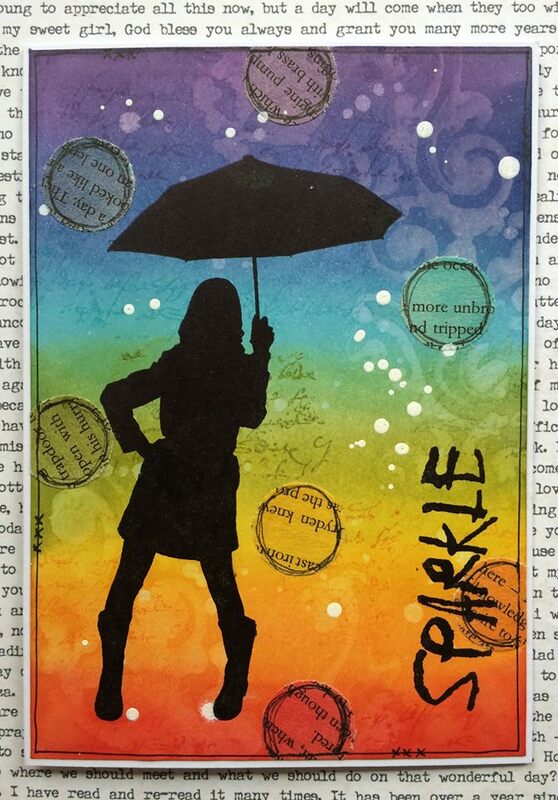 Pauline Butcher created this super sparkly card using our ‘Sparkle In The Rain‘ stamp set. Head over to Pauline’s blog to see how she created it. 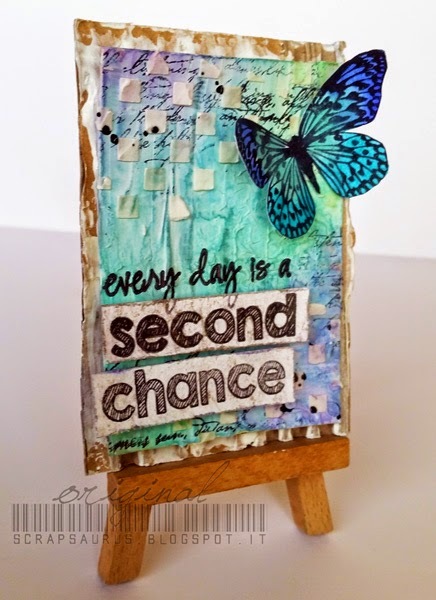 Susanne Rose made this stunning mixed media wall hanging with our beautiful ‘Live In The Moment’ stamp set. You’ll find more details on Susanne’s blog. Denisa Gryczova created this fabulous mixed media Monolith featuring our ‘Unicorn Magic‘ set. More details can be found over on Denisa’s blog. Kim Johnny has decorated one of our MDF Monoliths using our ‘Learn To Fly Again‘ stamp set. Amazing texture and brilliant interpretation of these gorgeous words. More details on Kim’s blog. Fabulous card created by Teresa Morgan featuring our funky ‘Visometry Set 1‘ stamps and the words from our ‘Shine Bright‘ set. You’ll find more details over on Teresa’s blog. 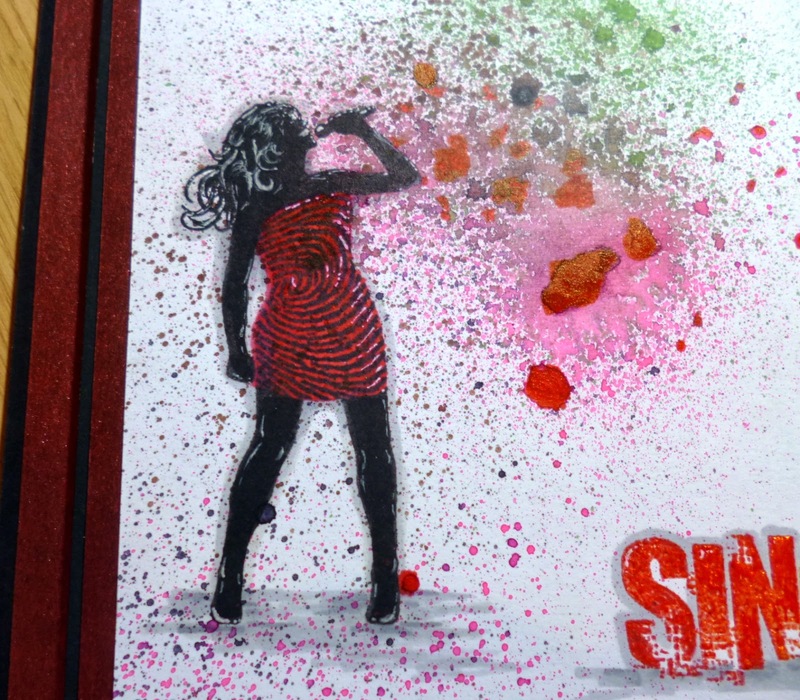 Amazing card created by Elina Stromberg with our ‘Sparkle In The Rain‘ stamp set. If you head over to Elina’s blog you’ll also find Elina’s brilliant Monolith featuring this set! Shilpa Nagaonkar has used our awesome ‘Just Hit Play‘ stamp set on her brilliant canvas. You’ll find more details on Shilpa’s blog. Sue Joseph has created this awesome card with our fantastic ‘Music Speaks‘ stamp, and the sound wave stamp from our ‘Background Noise‘ set. Brilliant card by Pauline Butcher using shrink plastic with the light bulb stamp from our ‘Shine Bright‘ set! Pauline has also used our ‘Ink Splats’ stamps for a really cool effect on the brick wall. Head over to Pauline’s blog for more details. 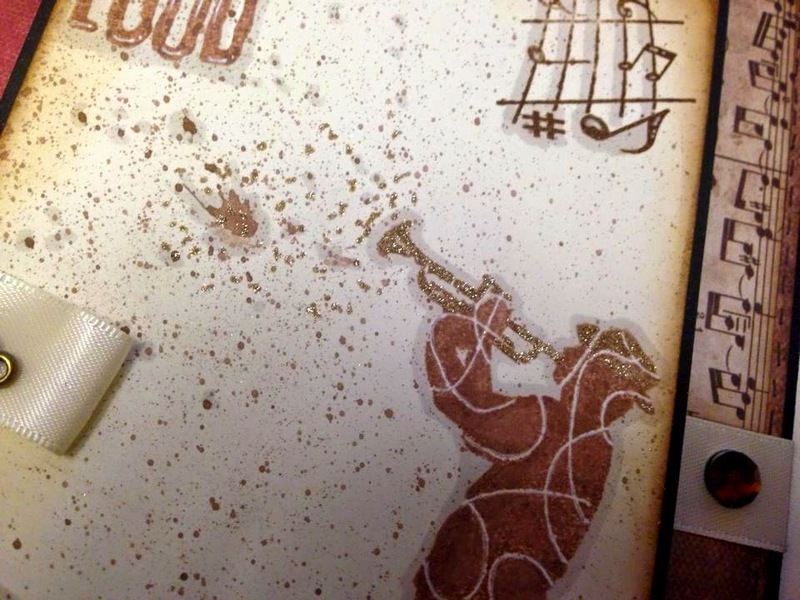 Corrie Herriman has created this awesome card featuring our ‘Jazz It Up‘ stamp set. You’ll find more details of how she created her fantastic background over on Corrie’s blog. 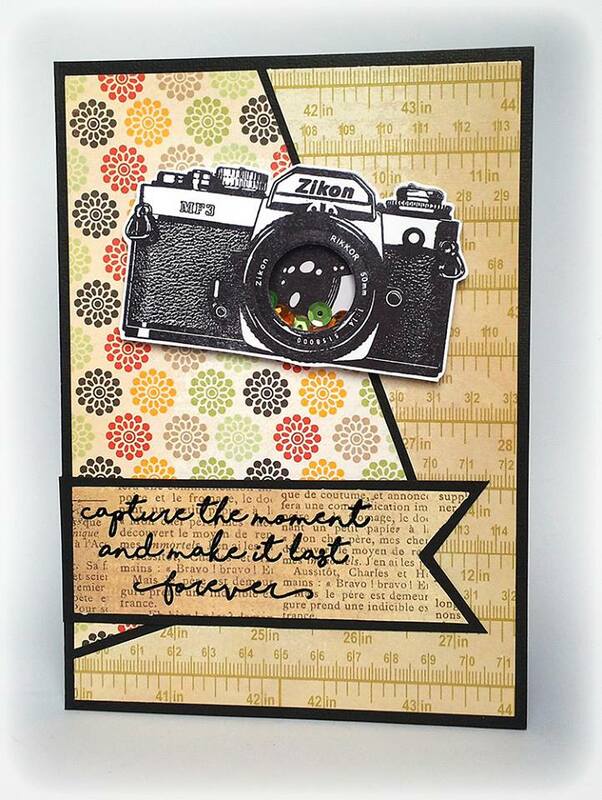 Susanne Rose has created this fabulous shaker card using our brilliant ‘Capture The Moment‘ stamp set. More details over on Susanne’s blog. Kim Bacon created this stunning MDF Monolith featuring our ‘Learn To Fly Again‘ stamp set, and the fabulous feather from our ‘Angels Are Near‘ set. 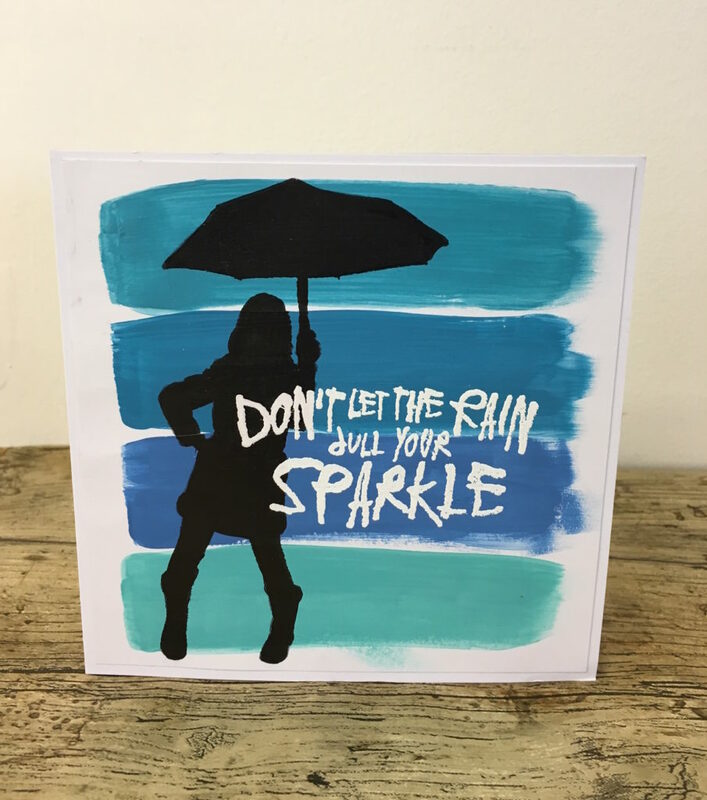 Katy Leitch created this fantastic card with our ‘Sparkle In The Rain‘ stamp set. You’ll find a great tutorial video for this card over on Katy’s blog. Dot Leathbridge has used the dragonfly from our ‘Live In The Moment‘ stamp set, and the gorgeous words from our ‘Vision INKognito‘ set to create her stunning card. You’ll find more details over on Dot’s blog. Carol Fox has created this fabulous trio of really cool shaped cards featuring our ‘Live In The Moment‘ ‘Sparkle In The Rain‘ and ‘Unicorn Magic‘ stamp sets! More details on Carol’s blog. 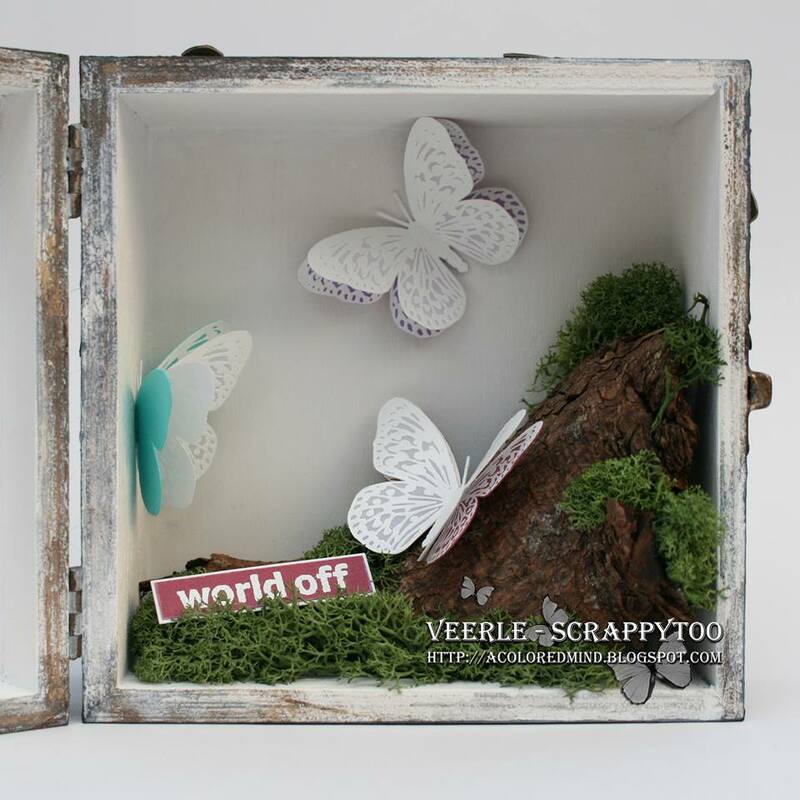 Veerle Moreels created this stunning tag with our ‘How Fragile We Are‘ stamp set. You’ll find more details over on Veerle’s blog. 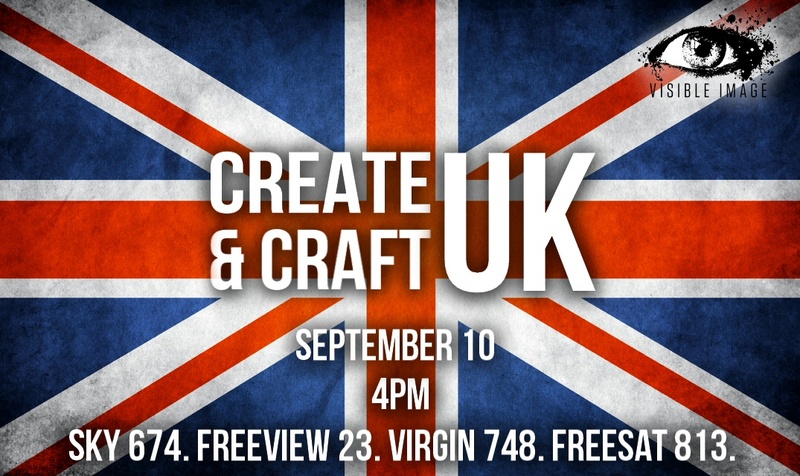 We are really excited to be back on Create and Craft TV in less than 2 weeks time, as part of their 13th Birthday celebrations! Tune in to watch Mark and Pauline’s brilliant demos on Saturday April 16th @ 1pm! And as always there will be some great multi-buys on the show! More details soon! Our April ‘Show & Tell’ challenge is open for entries, so whatever you create with our stamps this month, be sure to upload your photo to our challenge album over in our Facebook Group! You never know, it could be you winning the £25 voucher this month! Thanks for visiting and we hope you leave us feeling really inspired.. perhaps you are heading straight to our shop!!! Just want to finish by saying a massive ‘thank you’ to everyone who has ordered our stamps and MDF Monoliths over the past few months, we have been overwhelmed by the number of orders placed, and we are thrilled to bits that you are loving our designs! There is so much still to come this year… exciting times!!! For this card the background was made with Distress Inks and a blending tool on a piece of white card stock which was cut slightly smaller than the card. 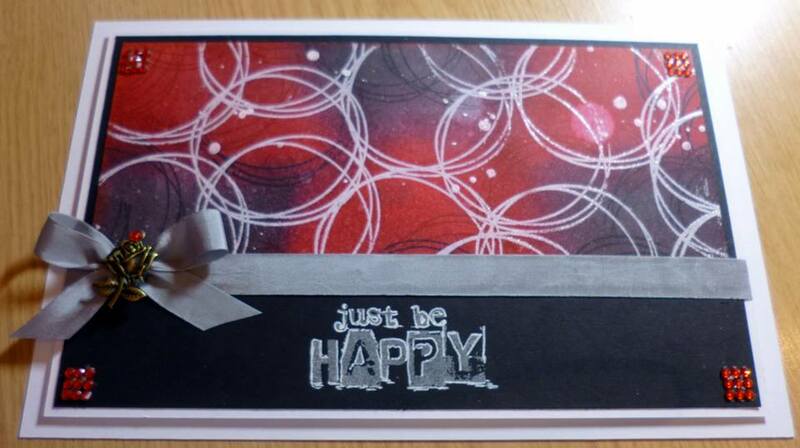 I stamped the background with a swirl and water and a script stamp with grey archival ink. Next I stamped the girl under the umbrella and splattered some white ink. I coloured some book text with the same distress inks and punched circles from it. I adhered these circles randomly on the card panel and then stamped part of the sentiment. I then doodled around the edge of the panel. Lastly I adhered the panel to the card. We have something very beautiful from Veerle Moreels coming up shortly, as she makes her debut here on the Visible Image blog! Hello there! Thank you for coming to visit us here on the Visible Image blog today! We are getting very excited now, as we will be heading off to Peterborough tomorrow for our Create & Craft TV show on Saturday morning at 11am! I’m sharing some inspiration with the super unique Visible Image Stamps. I made a CAS card using the “Butterfly INKognito” together with the “Live Life Now ” Stamp. This is a really quick and very elegant card! I used the Crealies Double Stitched Frame die and cut a rectangle shape from white cardstock. I masked a frame arround the base with washi tape, so that the stamped images don’t go close to the edges. 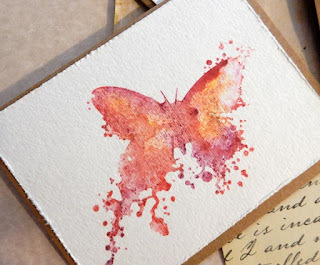 I stamped the Butterflies with Distress Inks. I used “Dusty Concord”, “Picked Raspberry” and “Spiced Marmalade”. 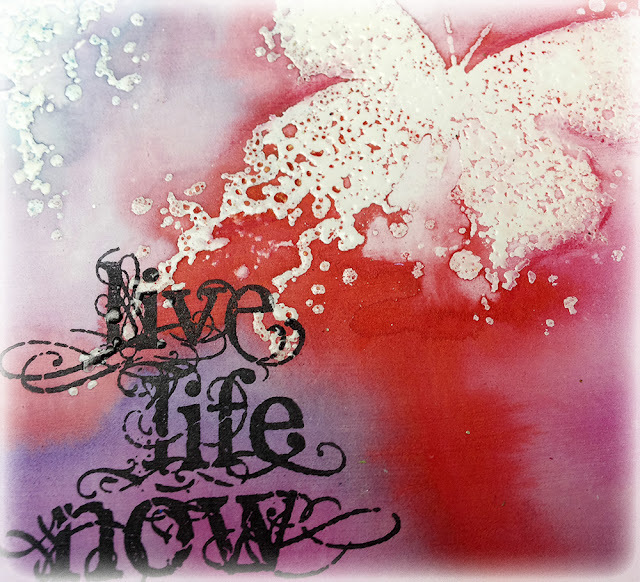 Finally I stamped the sentiment “Live Life Now” with StazOn “Jet Black” ink into the center. I mount everything with 3d foam pads to a white card. A simple card today featuring the gorgeous Where Dreams Take You sentiment. Colour stencilled through circles and over stamped with the simple circle from the Universal set. My tag has a dylusion and shaving foam background, and the Flower INKognito and Imperfection is Beauty stamps are heat embossed in wow black ebony. I’ve had really fun and made a Canvas for today! Lovely to play around with colors and make a big mess sometimes. I’ve used the Vision INKognito (eye) and the sentiment from the set Behind Every Mask. Think they fit well together. I’ve used only acrylic colors I think, and the white dots are heavy modeling paste. The eye is stamped on tissue paper and glued with decopage laque. The green in the eye is painted with pitt pastel pens when the decopage glue was dry. The size of the canvas is 6″ x 6″. 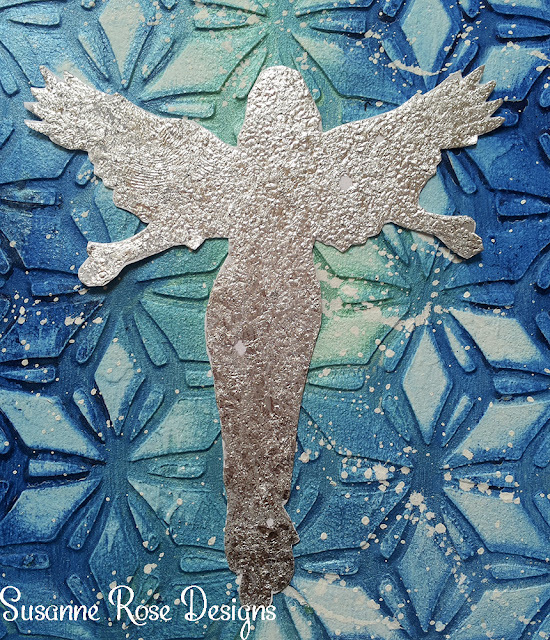 I have used the beautiful Angels Are Near stamp set to create a Christmassy mixed media canvas. To begin, I covered the canvas with some music print paper, torn around the edges. Then I added some gesso around the sides to soften the paper edges, and in random areas over the paper. Once dry I stamped the feather and embossed in white all over the canvas. I wanted a metallic edge to the feathers, so inked the stamp again (but only on the edges) and stamped over the top of the white embossing powder, adding copper embossing powder this time. 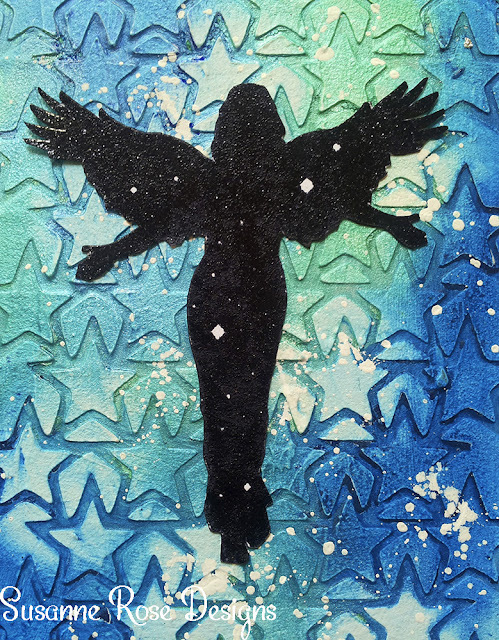 I drew a simple angel on some cardstock and painted with acrylic paint then cut out and glued in place. Next I stamped the sentiment, cut out and glued on to the angel. Finally I used some Pumice Stone Distress Ink around the edges of the canvas to age it and take away some of the whiteness of the gesso. You can watch our show live at 11am this Saturday on Sky 674. Freeview 36. Virgin 748. Freesat 813. You can also watch online on the Create & Craft TV website! There’s a fantastic bundle of Visible Image stamps up for grabs over on the Create & Craft TV Facebook page, so head on over and give their page a like (if you haven’t already!) and look down the wall for our giveaway photo! Then comment and share the post for your chance to WIN! The lucky winner will be chosen on Friday. Come back and see us here tomorrow as we have more stunning new show samples to share with you. If you fancy applying to join our Design Team there are only a few days left now, it closes on Tuesday December 15th! More details HERE. Hello There! Thank you so much for coming to visit us here on the Visible Image blog today! We are catching up with all the latest cards and projects from our wonderful team today, the blog has been a little neglected these last few days… first we had our crazy Black Friday SALE which you loved!!! And we are working non stop making lots of gorgeous stamps for our fantastic return to Create & Craft TV on December 12th 🙂 Mark and Pauline have some amazing demos planned… can’t wait! Ok, are you sitting comfortably and ready to be inspired? I’m back to share some Visible Image inspiration with you. It’s a simple tag, I love tags, because they can be so quick to make, and there’s no pressure, lol !!!! I used Brusho’s on the background, sprinkling and spritzing, then holding the tag on it’s side to drip down. I stamped using Versamark ink, and heat embossed with Black EP. The sentiment was heat embossed onto a small piece of card, again after Brusho’s had been dripped down it. The Viscose ribbon ( American Seam Binding) was coloured using Distress Inks. Simple, I hope you’ll give it a go. Hi my dear Visible Image Friends! 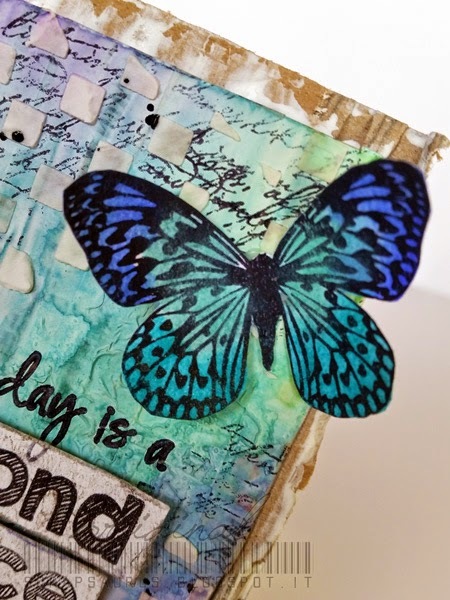 I’d like to share a mixed media card today, which is created with the gorgeous Butterfly INKognito and the Live Life Now stamps from Visible Image. I primed the background with white gesso first. After this was dry I embossed the butterfly stamp with clear powder. I also stamped part of the stamp in the left upper corner. I added colour with the Marabu Art Sprays. They are based on acrylics and can be removed from the embossed parts with a babywipe. The sentiment is stamped with StazOn. I wish you a nice day, Susanne. The weather finally feels chilly here, funny since about a week ago it was way above average and so hot! So continuing with my wondeful Wintery tags for Visible Image, I have “Baby it’s cold outside”, today! all 100% amazing Visible Image, “Baby It’s Cold”, “White Christmas” and “Rockin Around”. The background was created using various acrylic paints on my homemade gelatin plate. 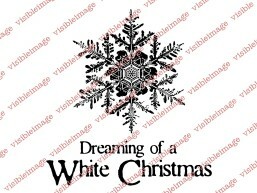 The snowflakes and sentiment were stamped directly onto the tag using Wow Opaque Bright White powder. The “Rockin'” tree was embossed with Wow Metallic Silver Ultra High. The Ultra High makes such an amazing texture, love it! I used a Perfect Medium pen to scribble the icicles and embossed in the same Opaque Bright White. To add more depth and “chill” I randomly added some UTEE clear all over the tag. Keep warm & cool where ever you may be! Oh I love working with these Visible Image stamps! This flower from the INKognito range is just amazing. The background is from remnants for a BIGGER Visible Image project which I am keeping under wraps for the moment. I first coloured some white card with Brusho paints and then applied a very dry layer of white gesso. For half of the card I then stamped the circles from the universal set and coloured some of them in with red Brusho. Another dry brushing with gesso before stamping and embossing in black with the sentiment and the flower. Each piece was then machine sewn onto black card. Click HERE to go to my KimzKrafts Facebook page. I go for green today! I love the beauty of a clean card. The background is made with 4 different green distress inks. 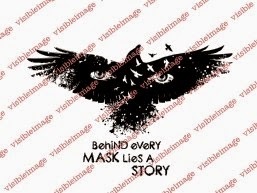 Then the mask and sentiment are stamped on top with black ink pad. To frame it I draw a line with a black thin marker. And yes – I used a ruler! You will find all our older inspirational posts over on the BLOG homepage. Come and JOIN the Facebook Group where you can show us what you have been creating with Visible Image stamps for your chance to WIN a £25 coupon in our ‘Show & Tell’ challenge! And don’t forget to LIKE the Visible Image FACEBOOK PAGE too where every Friday two lucky winners will WIN some gorgeous stamps! We will be back tomorrow with something beautiful and very festive from Teresa Morgan. Good Evening! Thank you for coming to visit our blog. Hope you all had a good weekend? Bit wet and windy here by the coast but then that is just how I like it! 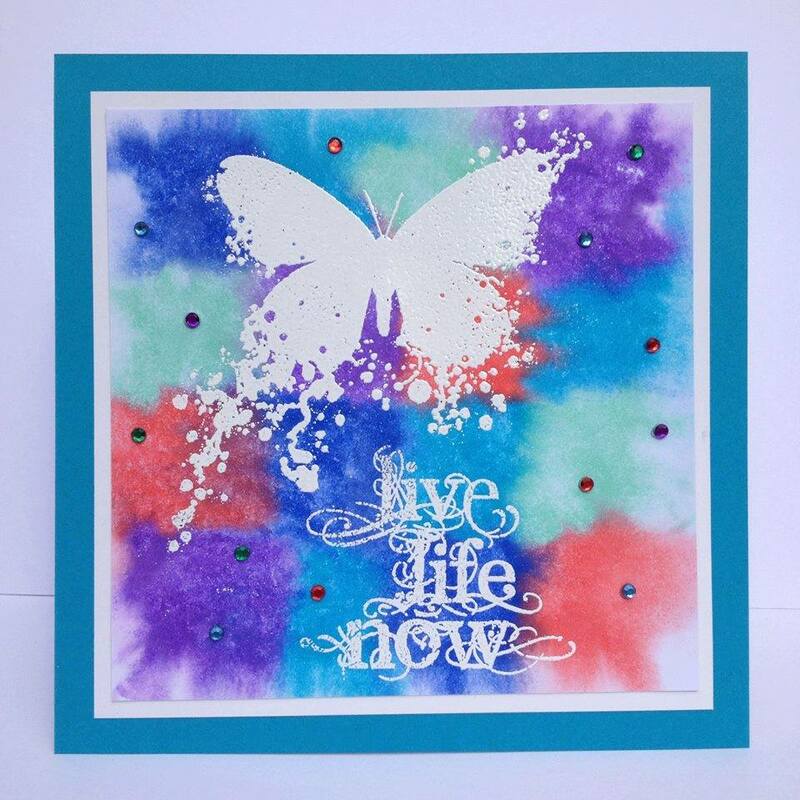 My project today features the lovely INKognito Butterfly stamp with the Live Life Now sentiment. It starts with the usual Brusho background and some simple white embossing. 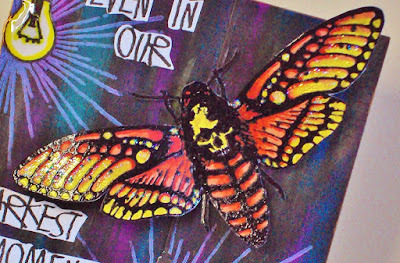 I used the splatters of the butterfly wings to edge the card. Mounting with white card makes the colours stand out. Show us what you have created with our stamps for the chance to WIN a £25 coupon in our Show & Tell Challenge! More details HERE! We will be back shortly with exciting NEWS! Hope you have had a fantastic weekend! You will find more Candy Box Crafts products HERE. They are such superb quality! Hello and ‘Happy Friday’ to you! Hope you’ve had a good week 🙂 The weekend is almost here!!! We are really looking forward to a couple of days off. We were up at 4am yesterday (for a very exciting reason!) but really feeling it today! Totally loved my new play with Brushos! I got an idea of trying with some other media then water, and it worked really well. I masked off the edges on a plain white cardstock. Poured a pretty large amount of PPA (perfect paper adhesive) over it and swiped it around with my finger (yes, I used gloves, can’t stand the mess). Then I powdered two different of colors of Brushos over the surface. It started to blend a tiny bit, but not much so I started to swirl and drag the colors around with my finger again in the PPA. I dabbed around until I was satisfied. But something was missing…. ahhh GLITTER! So I took my finest glitter and sprinkled it over it all and then started to dry it with my heat gun. Slowly and moving it all the time to not over heat the adhesive. I could have set it aside for a few hours probably, but naaah… I wanted to finished it up. It was dry after a while and I stamped the star from the Universal set serveral times on top. I used an archival inkpad. The sentiment Christmas Memories is stamped on Vellum and embossed in gold. Note to self – put glue on the whole piece next time as it shows through a bit… lol. Medium:PPA, Brushos, Glitter, Embossing powder. I made a 4×4 chunky canvas blank into a special little wall hanging using the one of the very special sentiment stamps as my focal point. It ended up looking a little vintage but I enjoyed the technique I used which was using a heavy bodied carvable paste coloured with ink and mica sprays to give it its rich tones, black lace and feathers always adds to the drama too. 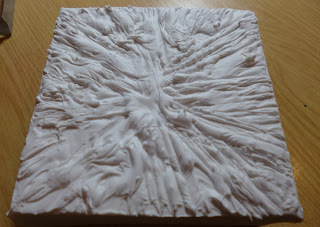 I added a good amount of modelling paste to the front of this chunky canvas and simply using a palatte knife carved into it before drying with a heat gun, you can leave it over night if you refer and then you can sand the texture paste etc too if you would like a different effect. I wanted it to dry almost fabric looking so a little softer for this piece though. 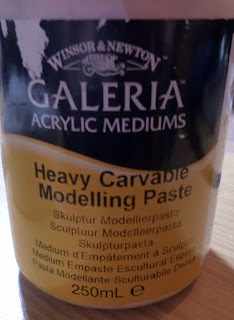 This is the paste I used.. 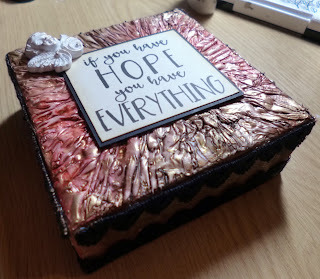 I added my sentiment using Pinflair glue so it would self level on the top, and sit how I wanted to contrast with the backing.I also added a little angle resin piece I had and added some classic treasure gold to the corners and the resin angel to pick out the features. Here it is diagonally so you can see the light from a different angle. I added some black marabou feathers and some little black bead stamens poking out of the feather too and some little pearls in the corners with a few tiny roses in a matching tone to the bottom right of the sentiment for balance.So that’s it folks it turned out really well and I enjoyed putting this one together..
Have a wonderful day and thank you for stopping by. Today it’s a quick card from me, as time has been running away with me this week! 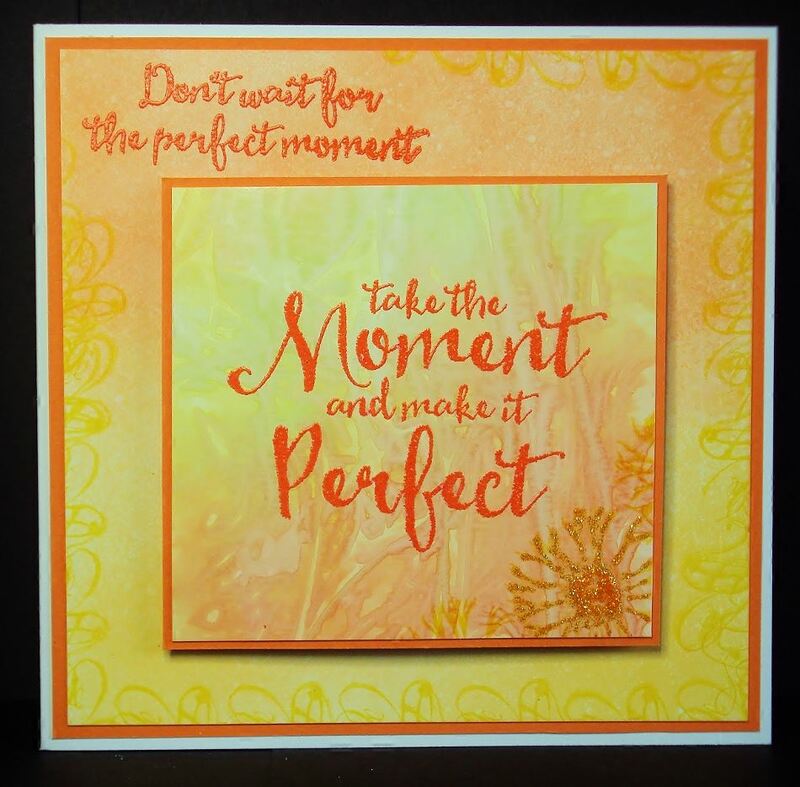 The background is blended Distress Inks with the binary stamp randomly stamped on it. I used Promarkers to colour the robot and monitor, mounting them on the card with 3d foam. The sentiment is embossed with WOW powders ultra fine white embossing powder. Thanks for stopping by – look forward to seeing you next week! Wake Up Awesome, Forest Background and Butterfly. I started off by sprinkling some Brusho’s on a piece of card, spritzing with water, then layering up more Brusho’s and water for a nice intense look, then dried it totally. I stamped the sentiment using Versamark onto this piece of card, then heat embossed it using white powder,and cut the card to the size I wanted. I decided at this stage that I wanted it to be very glossy, so using the Versamark pad I completely covered the card, and heat embossed using clear powder, and did this twice more. On a small piece of card, I stamped the butterfly using black ink, coloured it using a paintbrush and Brusho’s, then added Stickles on top for the bling factor. Finally for the background, I stamped the tree’s using Distress inks, then added some more Stickles as blossom. Thank you so much ladies… awesome projects! Show us what you create with your Visible Image stamps by entering our November Show & Tell challenge… there’s a chance for you to win a £25 coupon every month over in our Facebook Group! We are looking for NEW Design Team members who love stamping and creating mixed media projects! Check out our DT Call HERE! 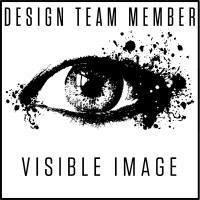 We have some very exciting news on the way this weekend, and so many amazing NEW designs ready for release early in 2016… it really is an awesome time to become part of the Visible Image team!!! Oh and don’t miss our ‘Freebie Friday’ giveaway over on our Facebook Page! Hi my dear Planner Fans! It’s my day today to share some inspiration with the super unique Visible Image Stamps. When you cover a book with another paper it’s important that you only glue down the front and the back NOT the spine! I embossed all my images with silver powder. The first inner page, which is normally white, was also pimped a little. Thanks so much for coming by today. A small post gearing up for the Holidays! 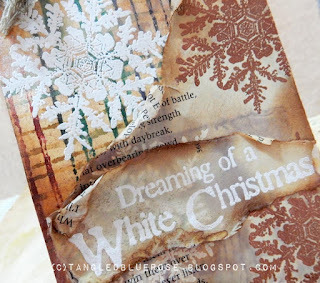 I had a small play making another Christmas tag, using my White Christmas Visible Image stamp set. I am really enjoying the vintage feel Holiday color scheme, the opposite of the bright colors I usually play with, hope you like it! My DT piece for today features one of my favourite, and unusual stamps from Visible Image. Back in February 2015 the guys at Visible Image came up with yet another brilliant set of stamps with a music theme. I can’t remember seeing any stamps like this before, and when they were launched they sold like hot cakes! It’s nice to revisit old favourites and I hope you are inspired by this card. First I painted a red and orange background using Brushos and then used some bleach to add the stars. 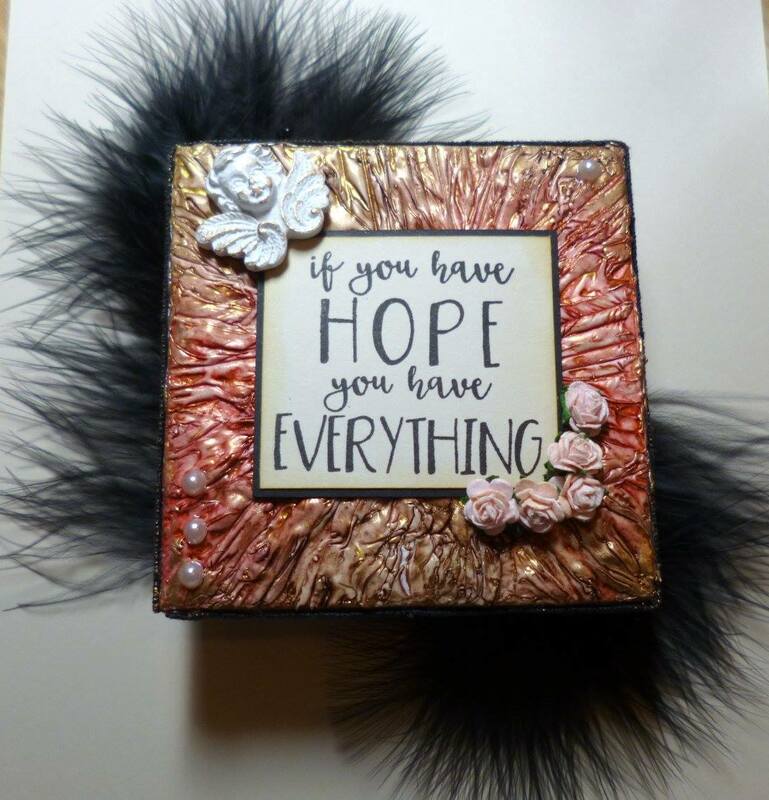 I used black embossing powder for the main image, the sentiment and one of the stars. Some mounting and layering and a little bit of wet brush work to add a shadow and the job was done! Feeling inspired? Show us what you create with our stamps over in our Facebook Group where our monthly ‘Show & Tell’ challenge is well under way!And there is a £25 coupon to spend on our stamps up for grabs! You will find all our awesome, original stamp designs RIGHT HERE! And you will be seeing a lot more of us very soon as we bring our amazing stamps back to your TV screens with live demos and much more! More details to follow soon!!! Thank you so much for visiting us today, enjoy the rest of your day. Hello There! We had a great time at the Hobbycrafts show in the NEC last week, it was so great to meet lots of our wonderful customers and we also met lots of crafters who hadn’t yet discovered our awesome stamps! We were thrilled to receive so many fantastic comments about our designs, our stand, and of course the amazing samples created by our brilliant Design Team. We’d also like to say a HUGE THANK YOU to Pauline Butcher who held fantastic ‘Make & Take’ sessions on our stand throughout the show, even teaching people who had never stamped before to create an awesome tag they were extremely proud of 🙂 Well done! 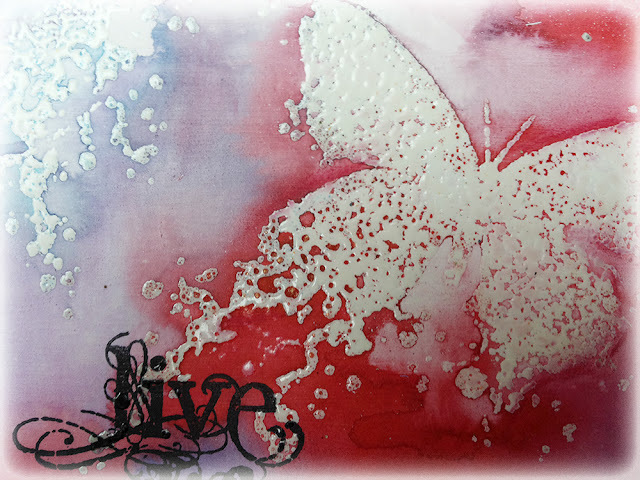 Today I have a mixed media canvas using some fabulous Visible Image stamps! The canvas is small, about 5 inches by 7 inches. It is primed with white DecoArt gesso. On top of the gesso, I did some random stamping using various Visible Image stamps. Over the base coat I added color using DecoArt paints and Derwent Inktense Color Blocks. 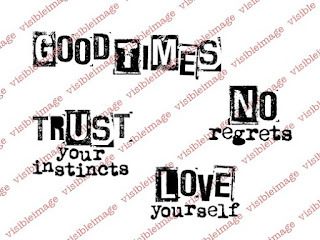 I used the “Good Times” sentiment from the No Regrets set. I wanted to try something a bit different to get more texture, so I stamped the awesome Flower INKognito in Archival Ink onto fabric. I stamped around the edge of the swatch with the ‘splatter dots’ portion of Flower INKognito. In the background you can see a few dots from the Retro Dots Background stamp also. I love this beautiful Poinsettia stamp, it’s adorable <3, the sentiment is from the Baby it’s cold set. For my background I used black and red dylusion spray and shaving foam, love it! Love that flower a lot! I just love to make christmas cards this time of the year. It starts to build up the right atmosphere before the ”big day”. The background is made by masking of a square and then add a few different colors of distress ink. I’ve used three different blue, but then I decided to add some pink in the middle at the end. On top of the ink I brushed a small amount of white/clear mica powder. Then I stamped the tree from Rockin’ Around set with black Versa Fine ink pad. Dried it a bit and the brushed on some gold mica powder. It sets even after a while since the ink dry very slow. Brushed of the excess powder. The sentiment from White Christmas set is stamped with the same ink pad but now on a piece of Vellum. Here the ink dries even slower so I heated it for a while, and then brushed on some blue mica powder on top to coordinate with the blue background. Mounted it on a card base and finally added some bling at the tree. If you are anything like me you will always be looking for different ways of using your stamps to get as much value for money as you can. This week I have taken a completely non-Christmas stamp set and created a fun Christmas card! My background is a piece of white cardstock which I sprayed with Goosebumps spray. (For those of you who haven’t come across this before, it’s a bit like a thinner version of Glossy Accents in a spray bottle. It dries completely clear and raised up, making a great resist for inks). Once dry I blended a couple of blue Distress Inks over the card, then with a damp kitchen towel quickly wiped over to reveal the ‘snow’. Then I added some torn card across the bottom and smeared some Stickles along the edge to create the snowy ground. I coloured the Alien with Promarkers, cut him out and glued in place. The little Santa hat is drawn freehand, then coloured and glued on his head! The sentiment is also from the Alien Invader Set. I stamped it in black then added the word Season’s with a red Promarker before cutting out and matting onto red card. The stamps I used on this week’s card are… Magic of Christmas, the top of the Tree from Rockin Around, Sleigh Silhouette, and the small starburst from Sparkle at Christmas. I started with a background made fom Brusho’s, just sprinkling the colour and spritzing with water, and letting it drip. I stamped the small star using a brusho and water mixture. The Sleigh was stamped using a Blue Versafine ink, along with the top of the tree stamp. The snow is white Frantage plus glitter, and the sentiment was heat embossed in white, and fussy cut. Stickles was added to finish it off. I LOVE shaker cards. And it was time to create my first shaker card with Visible Image Stamps. I picked the White Christmas set because I’m in love with the snowflake. I used it a lot of times during the last few weeks, because it is so awesome and so versatile! On this card I did an embossing resist technique with the snowflake and Distress Ink “Mermaid Lagoon”. I used silver powder to emboss the sentiment onto some Vellum. I decorated the shaker window with dies from Marianne Design and a little bit of snow, beads and sequins. The background is also colored with “Mermaid Lagoon”. It is so easy to build up these cards and they are so beautiful. Have you started getting ready for the Holidays, shopping, wrapping gifts, yet? Just in case you are at the wrapping stage….today I wanted to share a quick gift tag. I used the Visible Image stamp set, Rockin’ Around. Take a piece of white cardstock or your favorite paper. Fold the top down almost 1/3 of the way to make the flap. On the underside of the flap you can write your message or greeting. I stamped and clear embossed the full trees on the inside first. Then I stamped and clear embossed the tree on the top flap. I masked off the lower ‘underneath tree’ portion with the clear plastic sheet the stamps are covered with for storage, I did not want to get a ghostly image if I did not line it up perfectly. I added color using Distress Inks in vintage tones. The spritzed with water mist. Once dry there were some areas I wanted to tone down so I used some Dylusions spray ink in white. 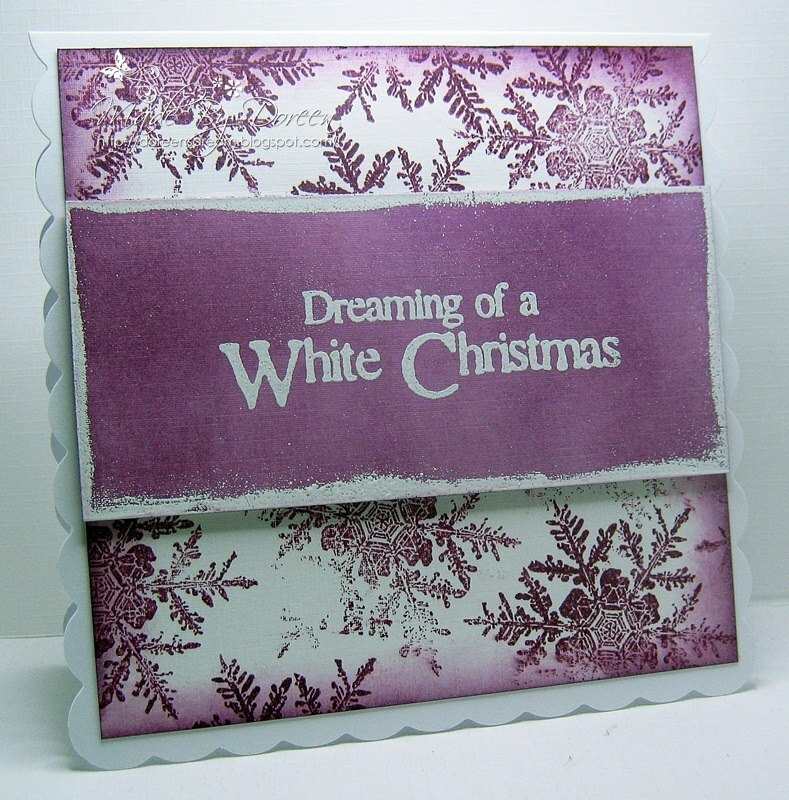 A simple card today, just white and mauve. I started by painting a piece of card with watercolor paint, Brushos as it happens. When that was completely dry I used a coarse brush to apply a very very very dry brushing of white gesso in one direction only. Onto that I stamped the Flower INKognito and Imperfection is Beauty sentiment with white embossing powder. I tore the pieces to give a soft edge. As I had my sewing machine out on the desk behind me I decided to attach all the pieces with stitches. A scattering of white brads and voila! Today I decided to go real sweet (cute)! I’ve made a lollipop card. Easy to do with a paper straw and some fantasy on top. 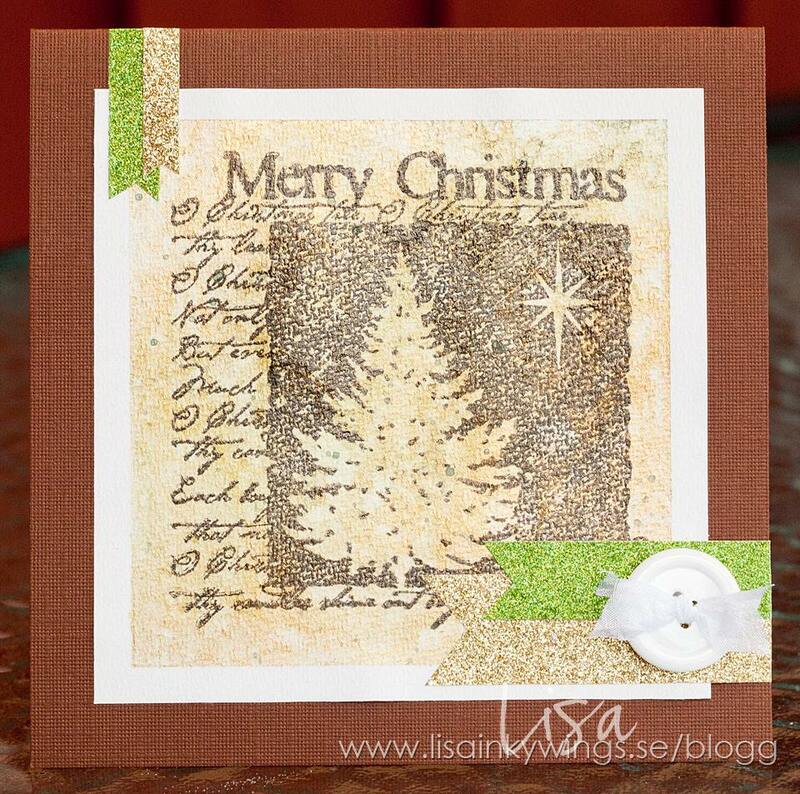 I’ve used the BIG Merry Christmas stamp on this one, and embossed the words with Platinum embossing powder. Die cutted the parts and two extra for the backside. Forgot to take a picture on the backside, but it’s only a white circle there in the middle so I can write a message if I like to. I did a double bow and attached a charm to it and then decorated with some bling around the circle. We’ve all been in Christmas mode for a while now so I thought I’d take a break from the festivities this week and share a funky birthday card. I have used the amazing Captain Awesome Set to create a fun shaker card! The background is blended Distress Inks with some faux bleach spots (created by splashing some water then dabbing off with kitchen roll). The image is coloured with Promarkers, then cut ut and glued onto the background. I die cut a circle aperture in some teal card, stamped and embossed the sentiments, then attached some acetate behind the aperture. This is mounted on 3d foam with some star sequins inside. We are sure that you’ve been suitably inspired by all these amazing samples! You can get your hands on all these stamps over in our online shop. Postage is just £1.50 within the UK and £3 everywhere else 🙂 Or why not make a ‘wish list’ and give it to your family for Christmas pressies…. it’s just 6 weeks away now, can you believe that?! Thank you so much for coming to visit our blog today, we’ll be back later with a PINK step by step tutorial from Kim featuring our gorgeous Stay Strong stamp, and tomorrow Pauline will be here with her ‘Fabulous Friday’ post. Hi There! Thanks so much for visiting our blog today. We are continuing with our PINK themed projects, helping raise awareness of Breast Cancer during October. You will find lots of very important information over on the Breast Cancer Care website, and see the difference they make to people’s lives… Such a wonderful charity that’s close to our hearts. On friday we are having a BIG PINK BLOG HOP which goes live at 8 am UK time! My creation this week was made by using a background made with shaving foam and funky fuschia dylusion ink. The stamps I used are my favourite Flower INKognito, the LOVE stamp from the No Regrets set and YOU from the Max Rocks set. Layered and matted onto white and black card…… I Love it and I love the fact that VISIBLE IMAGE are backing such a worthwile cause that’s so close to so many hearts! So to be in with a chance of WINNING this magnificent stamp, if you haven’t already purchased it, please leave a comment over on my blog and tell me what you love about Visible Image stamps! Simples! Thanks for dropping by and all the links you need are below…..
Buy yours now and £3 will be donated to Breast Cancer Care. You can see how we are doing so far over on our Just Giving Page! We will be back tomorrow with more PINK inspiration! Please come and join our BIG PINK EVENT over on Facebook where you will get to see Friday’s AMAZING PRIZE!!! We are turning everything PINK this week in support of Breast Cancer Care’s BIG PINK fundraising event! Our Design Team are getting ready for our BIG PINK BLOG HOP this Friday, October 16th, and have been creating some gorgeously PINK inspiration to inspire you to enter our PINK Show & Tell challenge this month… you will find more details HERE! We really hope you will join in, and help us raise as much as we can for this wonderful charity. I built up the background with some stencils, and drywall tape. The Visible image stamps Grunge Harlequin and Ink Splats are the border images. My center is the fabulous Butterfly INKognito. Leave Your Fears Behind is embossed and cut apart for movement. I adore this powerful statement. It is wonderful! It’s the month of breast cancer awareness… I made a pink card that should signalize courage and strength! Cancer is a horrible disease and so many people are affected. I used the Retro Dots Background stamp from Visible Image and embossed it with white embossing powder. The embossing acts as a resist to any kind of watercolor. I used Distress Inks to color the card. For some more texture I used the swirl and the script stamp from the Revolution Set. I added two sentiments, first the one from the Cheshire Cat Set (Which way you go depends on where you want to be) and second “This is Me” from the This Is Me set. The die cuts are from CAS-ual Fridays and Die-Namites dies. I embossed one of the branches with Distress Embossing Powder. “This is Me” is stamped with Memento Luxe and embossed with clear embossing powder. I added some half beads and sequins to finish it up. I have gone all out for my project today, well, I don’t ever do subtle do I? I used Dylusions mister inks on this card and the colours are very intense. But they fit the brief, which is to create in pink. Enjoy your week, get crafty and show us what you have been up to! As many of my regular visitors will know, I lost my lovely sister in law (more like a sister) Lynn to this terrible decease 4 years ago after a 6 year battle and many, many operations and treatments. You can read my tribute to Lynn HERE. The sentiment is very fitting for the kind of person Lynn was. I stamped the Butterflies on a piece of card and coloured using the same inks as the background, then cut them out and glued them to the piece leaving the wings loose so they stand up, adding dimension. To finish off I stamped the sentiment from the Time After Time set and added it to the card along with some silver card candy. Will you create something using your Visible Image stamps for our BIG PINK fundraiser? All you need to do is donate at least £1 to Breast Cancer Care through our Just Giving PAGE (please leave your name) and then upload the photo of your card or project to our Facebook group. We have some amazing prizes on offer for 3 lucky winners who will be chosen at random from all the entries. Not got any of our stamps yet? Then why not buy our STAY STRONG stamp as your first Visible Image purchase? You can then use it to enter our PINK challenge! Please join us tomorrow for another PINK project, and if you want to be in with a chance of winning one of our fabulous prizes this month… come and join our BIG PINK Facebook Event! Thank you so much for visiting our blog today, and if you have missed any of pour recent inspirational posts, you will find them HERE. Hello and welcome to our rather neglected blog… well just lately anyway!!! It has been a busy old time here at Visible Image basecamp for a number of reasons…. Loads of orders (thank you! )…exhibiting at quite a few craft shows… a road trip and some very exciting meetings… AND and lots of designing too!!! I LOVE this verse, it’s called The Best Days. 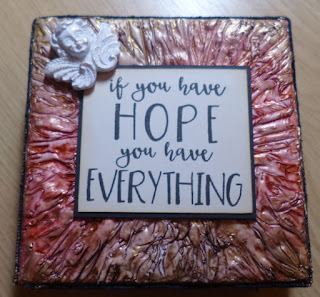 I used wow black ebony to heat emboss it and with a verse like this you dont need a busy card, hence just my paint splats, the words say it all! I created the background with my new toy the Art spinner and used shimmer paints and neon paint. Layered and matted onto some green mirror board and kraft card and finished with some flat back green gems and hessian. ribbon. No your eyes are not out of focus, lol, I wanted to try something a little different with this card, and I used a couple of super duper Visible Image Stamps. My inspiration came from a retro 3D poster I saw recently, although I haven’t tried to view it through a pair of 3D glasses, lol, but you get the idea !!!! The Visible Image stamps I’ve used are You are Loved and Grunge Polka Dot. I stamped the background with the Grunge Polka Dots, 4 times, using 4 different Distress ink colours, I also did the same on another piece of card and stamped the sentiment in Versamark, heat embossed it using clear embossing powder, fussy cut it, mounted it onto black card and fussy cut it again, to give a thin black outline. And hey look, no bling or glitter used, that was incredibly hard, lol !!!! This week I am sharing a bright and beautiful card.. I have stamped the Ink Splats with various colours of Distress Ink to create my inky rainbow. I then took the music wave stamp from the Soul Music set, and stamped with black Archival Ink, then flipped the stamp upside down to continue the flourish across the page. I love how the music notes are not all ‘the right way up’, so you can use this stamp in any direction without it looking odd! The wonderful sentiment I’ve used today has gone PINK this month! Not the actual stamp, but the package. It’s called STAY STRONG and during october 50% of the sales for this stamp will be donated to Breast Cancer Care! Buy yours now! I’ve played around with pink inkpads that react with water, and some mists to do my background. The horse is from the Revolution set, and the darker spots around the edge are stamped with part of the other horse from the same set. When it was dry I stamped the sentiment on top of it all. I have used Gelato’s for my background and over stamped with the Bronte Script. The leaf stamp and sentiment from the Colours of the Wind set have been inked up with Red Geranium and Potting Soil Archival inks. I have been having a look through some of my old stuff and saw this little gem which didn’t get published last year. It is still such a cool technique and it is nice to revisit some of my older projects. It means that new visitors to me and Visible Image don’t miss out on something! So, I started with a nice crisp piece of white card. Using those pots of inky paint from Pinflair called Gentle Blends, I applied colour to the daisy silhouette from the Happy Birthday set from the ‘More Than Words’ range. I used a sponge to apply the colour directly to the stamps. I stamped the first time onto my base card and then did a second stamping onto a separate piece of white card. This gave me a vibrant first impression and a dull, light second impression. I then used the seeded flower head silhouette from the Thinking of You set, again from the ‘More Than Words’ range, to overstamp the coloured daisies in black ink. On the piece of card that I had done the second impression stamping, I used black ink to stamp the Create With Your Soul sentiment. All pieces were layered onto black card and the sentiment was added to the main card using foam pads to raise it up. I’d like to share a card today on which I used the awesome Smile Sparkle Shine stamp. The background of the card is created with Twinklings H2O. The Visible Image sentiment is stamped with Memento Luxe and embossed with clear embossing powder. A very simple card to make, I used some Brusho paints on the background, mixing them with water and just washing them over the card. I then used some Spectrum Noir Aqua Tint inks, and using the dropper provided in the kit, just dripped them down the card. 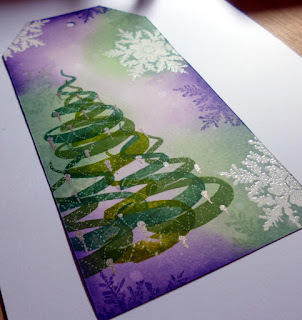 This gives the impression of trees, so I stamped Winter Tree with Distress Inks onto the inky background. 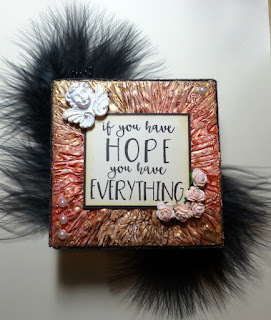 I finished off with the sentiment stamped in Versamark, and heat embossed with Black powder, I filled in the letters with some Stickles for that little bit of sparkle. I am so happy it is October! I love the cooler weather, here for me it should be soon anyways! And of course, I love Halloween! Today for my Visible Image DT play I made a tag using the wicked Zombie Dawn set! She is a bit more ghosty I think… On top of the acrylic paint and ink background, everything is heat embossed. I really love how embossing makes everything shiny and adds more POP! The pumpkins are made with texture paste using a Dreamweaver metal stencil with orange embossing powder on top. Zombie Dawn, the hands and sentiment are all fine stamps by Visible Image! I hope you have fun getting ready for Halloween later this month and I would really love to see what you make! Time for some more inspiration using stamps from the fab Visible Image..
First I stamped the Poinsettias from the Pointsettia Stamp Set, then used Brushos to add the colours. Starting with the flowers, I took a paintbrush and painted the flowers, with water, then sprinkled just a tiny amount of the red Brusho and spread it around a little to fill in all the petals, I did this for each flower. Then I painted water onto the background, and again sprinkled the Brushos, letting the colour spread as normal, but using the paintbrush to help the colour spread. I finished off with gold gems in the flower centres and the Merry Christmas sentiment. We hope you have been suitably inspired! Throughout October, we are raising funds for Breast Cancer Care with fun challenges, competitions, and our BIG PINK BLOG HOP! There are some amazing prizes to be won so we hope you will join in and show your support for this wonderful charity. Breast Cancer Care’s BIG PINK event will help more people find a way to live with, through, and beyond breast cancer. We hope you will come and join our Facebook BIG PINK EVENT! We are also giving you a fantastic 20% OFF all our stamps until the end of October… how awesome is that!!! Enter coupon code: thankyou20 at the checkout to get your discount! We will be back shortly with some fabulous PINK PROJECTS from the team, to inspire you to enter our PINK challenge! And make sure you visit our blog this coming Friday (October 16th) and take part in our BIG PINK BLOG HOP!!! Thank you for visiting our blog today! We must offer our apologies for neglecting our blog lately.. it’s been a hectic few weeks with back to back craft shows, what with making all the stamps needed for those on top of all the orders! Good job we love what we do.. must admit we are two very tired people at the moment!!! Some of our fabulous Facebook friends showing off their Make & Takes! This weekend we will be at The Happy Stampers Festival in Port Sunlight on Saturday, and this time Pauline Butcher will be demonstrating our gorgeous stamps on our stand! This is a ticket only event and a fantastic show! I’d like to share a stamped Christmas box today. I embellished it with the lovely Poinsettia stamps from Visible Image and two die cut ornaments from Noor! Design. The box is cut with the Silhouette Cameo out of kraft cardstock and embossed with the script stamp from the Visible Image Revolution set and white embossing powder. I distressed the edges of the box with a scissors. The poinsettias are stamped with a darker red on red cardstock and embossed with clear embossing powder. Now I only need to fuzzy cut the flowers and adhere the pieces together. Today I have a bit more winter spirit inspiration to share. I used one of the new Visible Image Christmas stamp sets, “Baby, it’s cold outside”. The snowflake is so detailed and so awesome for any Winter project. 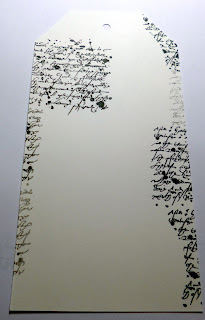 The background is layered with some stencil work, Tim Holtz “Gothic” with modeling paste. Then several layers of DecoArt acrylic paint, antiquing cream and some Distress paint. 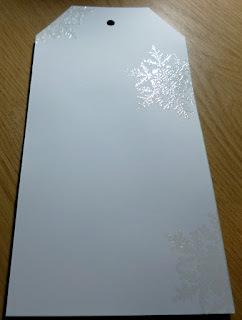 I used Ranger Super Fine White embossing powder on the beautiful snowflake and sentiment. I created the swirly background using the shaving foam technique, such a fun thing to do! I then over stamped that with the snowflake stamps from the White Christmas set, and heat embossed using white embossing powder. Then I stamped and mounted the Snowflakes & Butterflies verse (which was written by Helen). Here is my inspirational piece for you today on this wet, and somewhat autumnal day! I have used the Imagine Dream Inspire stamp set, Grunge Polka Dot background stamps and the scribbles circle stamp from the Universal set. For my CAS tag today I used 2 inks Memento tuxedo black and festive berries DI (My favourite red). Today I have something to show that isn’t Halloween, and it isn’t Christmas either. I have manage to do something else – lol. I spend my weekend at a crop in Norway and got some inspiration for a tag so I just had to play a bit. This is what ”came out” of it. I’ve use the Robot Data Set from Visible Image for this tag. I started with stamping the numbers on my white tag with embossing ink. Then I used clear powder. Then I started to mist and drip a bunch of different colors on the tag until I was satisfied. I ran the tag through an embossing folder to get some structure, and added a dark distress ink around the edges. I added a bunch of embellishment and colored my hug snug ribbon with mists and alcohol inks. When the tag was ready and the robot mounted with 3D foam I covered the whole robot with Diamond Glaze. I am sharing a quick and easy card – perfect for those of us who have a lot of Christmas cards to make and not a lot of time. 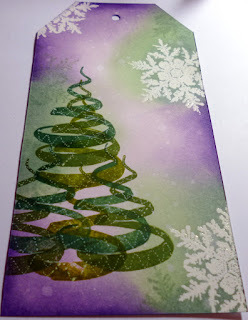 I’ve used the fabulous Merry Christmas XL and Grunge Flourish from Visible Image stamps. I stamped the flourish in each corner and embossed with Candy Apple embossing powder from WOW powders. The sentiment is embossed in black and layered onto a die cut oval. The whole thing is matted onto silver mirri card for a bit of Christmas bling! It’s my day today to share some inspiration with the super unique Visible Image Stamps. I’d like to share a “Cookie Cup” today, which is decorated with the super cool “Rockin’ Around” set from Visible Image. The Christmas tree and the sentiment is stamped with Memento Luxe ink and heat embossed with clear embossing powder. The cup is a cutting file from Silhouette Store. The tree is cut with the Pix Scan Mat and the Silhouette Cameo. I started off making a postcard, so it is 4 inches by 6 inches on mixed media paper. I added lots of fun layers of Distress Ink and water. I have just picked up some of the micro beads and wanted to play with those too. Then I was looking at my dies and have this Spellbinders Aster flower that was calling out to me, so I had to make one! I really like how it frames the awesome sentiment by Visible Image, “Create your imagination” from the “This is me”,set. So now my postcard has dimension, which is really fun but I don’t think it would go into the mail system very well as a traditional postcard! So it is a small canvas with lots of color! The background was created with Distress Inks, and over stamped with the Where Dreams Take You and Plasma stamps. The sentiment was heat embossed with gold embossing powder. 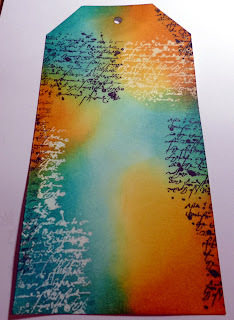 I started with a Brusho coloured piece of card in shades of purple, lime and teal and added the really useful Bronte Script stamp using teal ink. Just a hint of it stamped randomly but always level. I added some ink splats stamps in purple and teal. When that was done I cut the piece down before sewing it to a matting layer of cream watercolour card. The tag was cut from another coloured piece of card but this time instead of the big purple splats I used the Live Life Now sentiment. Again I sewed this to a cream mount. Both these mounts were then roughed up along their edges. I added some brads to the tag, my current favourite embellishment! I got a new toy at the weekend, I’d had one as a child and didn’t think they were made anymore! But they do, only the name is now ‘Art spinner’ not ‘Twirl o paint’. All it is is basically a spinning motor, you attach your card on top and drop your ink/ paint onto it whilst its spinning! Each creation is always different, I’ve made lots lol so watch this space! So for today’s I used some shimmer paints on neenah card and my fave Visible Image stamp Flower INKognito. It’s just so bold and grungy I LOVE IT! The superb sentiment I used is ‘Mistakes are good they make us wiser’ from the Sunshine Set. Both stamps are heat embossed in black ebony wow. I mounted my card onto black and cerise mirror board which really complements the cerise and black in the design 🙂 I hope you like it and there’ll be lots to follow haha! Ho Ho Ho! Does anyone know if Aliens celebrate Christmas? I have no idea, but why not? I think this guy from Visible Image wants to, if he just can get some snow! Alien is from the Alien Invader Set, Tree is from Rockin’ Around, and the sentense is from the set White Christmas. I’ve distressed a piece of kraft cardstock with some brown and green ink. Then I stamped the trees with the same green ink I just used. They are misted with water before stamped. When it was dry I splattered some white and glitter white mists as snow on the piece. Added sequins and bling for snow on the ground and some sequins as ornaments in one of the trees. Finally I stamped the sentense and mounted the red Alien with 3D foam and mounted the piece on a Kraft Card. HUGE ‘Thank you’s’ to everyone on the team for your amazing work! We love the way that our team think ‘outside the box’ and it’s always so exciting to see what they create with our stamps 🙂 You will find all the links to our Design Team blogs HERE. We will be back a little later with Kim Roberston’s step by step tutorials for her stunning Ally Pally tags and demo cards. Until the end of October we are giving you a HUGE 20% OFF all our stamps! Throughout the whole of October we will be fundraising for Breast Cancer Care, a wonderful charity here in the UK who make a real difference to people’s lives. You can find more details over in our Facebook EVENT, or look out for our blog post later today giving you all the information you need to join us in raising money for this very worthy cause. We will be running fun competitions, challenges a BIG PINK blog hop and more! We hope you are having a great week so far… and hope to see you back here later today for more awesome inspiration created, of course, with Visible Image stamps! Here’s our US Design Team member Kim Johnny with some awesome mail art! Today I wanted to share a new pair of mail art postcards I made using my favorite Visible Image stamps. Each postcard is just about 4 inches by 6 inches and full of mixed fun! I used the fabulous Flower INKognito and Butterfly INKognito stamps by Visible Image. 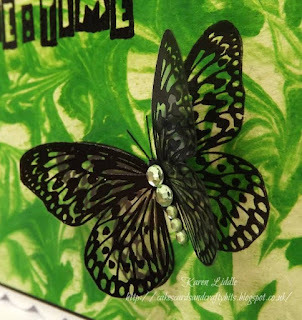 I stamped Butterfly INKognito onto tissue paper using Ranger Jet Black Archival ink. The background I created using the ARTplorations stencil Old Rose Prints with DecoArt modeling paste and Americana acylic paint. The background here was made with DecoArts Fluid acrylics Quinacridone Violet and Titanium White, misted with water and mixed on my craft mat. The flowers are heat embossed in white. 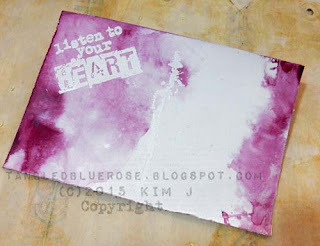 I added the Flower INKognito stamp and “Listen to your Heart” is from the “This is Me” set. Thanks so much for coming by today! Hope to see you again soon! Come and JOIN the Facebook Group where you can enter our ‘Show & Tell Challenge’ for your chance to WIN some awesome Visible Image stamps! And don’t forget to LIKE the Visible Image FACEBOOK PAGE too! Thanks Kim for your great tutorial too! We will be back tomorrow with some awesome new inspiration from Kim Robertson and Lisa Nygards. Hi There! We are back as promised with more awesome inspiration for you from our wonderful team..
It’s my day today to share some inspiration with the super unique Visible Image Stamps. I made two mixed media postcards using Neoccolor II pencils and gesso for the background. I used the script stamp from the Revolution set to add some texture. The doodling is made with acrylic markers as well as uniPOSCA markers. It’s always good to have some postcards ready to go! I am a big fan of the Visible Image expression stamps. 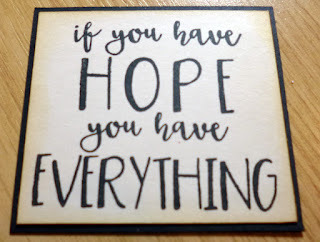 They are perfect for cards and also for art journalling and they are so true! I have simply stamped this onto some cream card, inked around the edge and attached it to some Frayed Burlap, this was then attached to some red card and my base card. I finished off with a Diecut Fir Tree. I used Distress Inks for the background, blended with sponges. Colours used are Dusty Concord, Mustard Seed and Picked Raspberry. I also splashed drops of water over the ink and dabbed off, this removes the colour and creates white spots, love doing this. Visible Image very recently released some wonderful Holiday stamps and I am feeling lucky to have received some to play with 🙂 I am not quite ready for the Holiday Season, so I have an alternate use for the beautiful Sparkle at Christmas set. I used the bigger sparkle from the Sparkle at Christmas set to frame the “Imagine” focal point badge. Imagine is from the Imagine Dream & Inspire set. Love the sparkle set it is so flexible and can be used so many ways! The stamping and embossing are wonderful as well, makes playtime a breeze! The top of the tag is capped with the Retro Dots Background stamp. I included and extra photo here to show more of the embossing, I am sooooo hooked on embossing. It adds such a fun and perfect touch. This is also the first time I have used some Lindy’s Stamp Gang embossing powder in Razzleberry Plum. Change the angle and the color of the EP changes too. Awesomeness! Now I need more, many more, colors of Lindy’s 🙂 I had to add some juicy fun dots from the Plasma set in Razzleberry Plum around the edges. Today I have decided to do something a little ‘shocking’ in that I have used some funky colours with jet black shiny embossing powder. Not the usual Christmas colours I know but that is where my crafting session took me! I went with the usual thing, make a lot of background papers using Brusho paints and stamped directly onto them with black embossing powder. Matting and layering with red card and adding a few brads finish the projects off. No Christmas cards from me today. I’ve tried to do a more masculine card, even though I’ve used flowers and dolies. *smile* I have used the character from Jazz it Up and the sentense from Thank You set. I stamped the images on a page from an old German book (have no idea what it says), and mounted that on cardstock panels since it’s a bit flimsy as is. 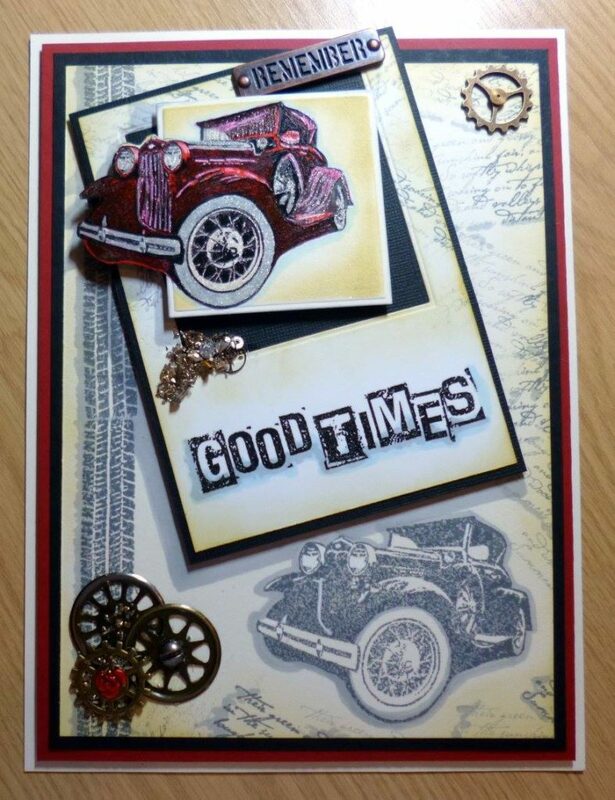 I love cards like this that have a hand made background using gorgeous stamps and then all the accessories match and make you think the words are perfect which of course they definitely are. 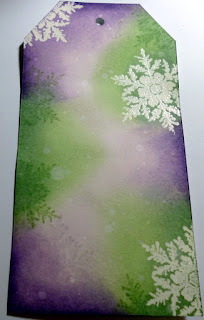 I used Momento Grey Flannel Ink and the White Christmas snowflake from the stamp set. I also used Vintage sparkle glitter for this one as I just loved the different colours in it, pinks and greens and white but all very very sparkly and pretty. 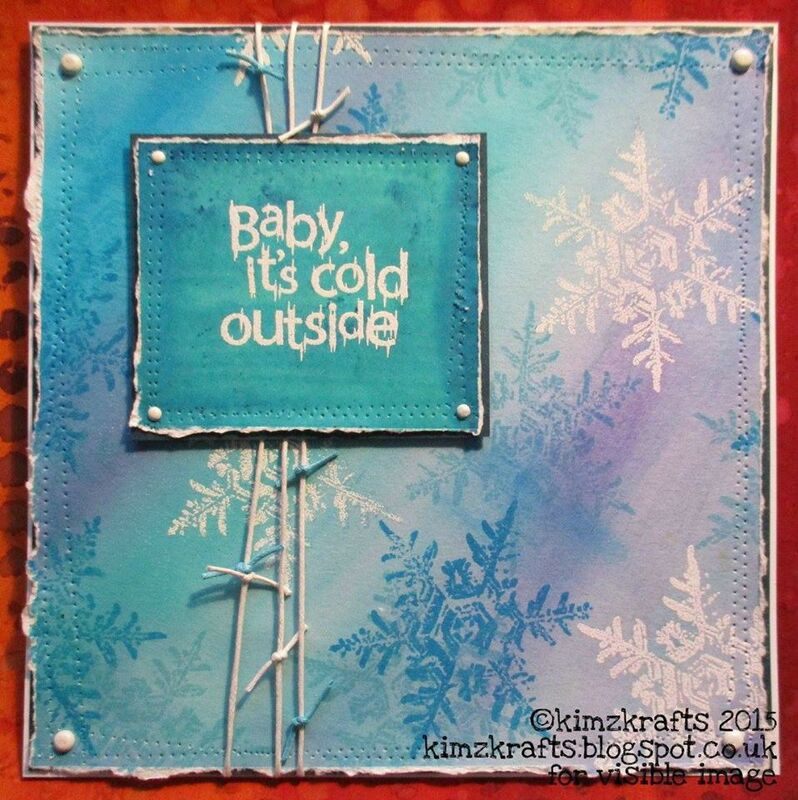 We will share Kim’s brilliant tutorial for this card over the next few days! I love using kraft card at Christmas – it reminds me of gingerbread! 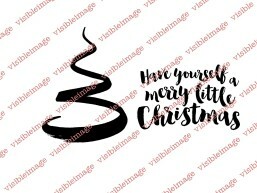 I have paired the Merry Christmas stamp with the gorgeous Grunge Flourish for this first card. Both are stamped with Versamark, and embossed with WOW powders in red and white. My second card is less traditional. I used the Grunge Polkadot background with Picked Raspberry Distress Ink and used black embossing powder on the sentiment stamp. It’s right up my street, as you all know I do love a bit of bling !!!!! Please excuse my photo, I couldn’t seem get a good image for some reason, anyway……. I started off with a shaving foam and Dylusion background, this was a second print, so it was nice a pale. 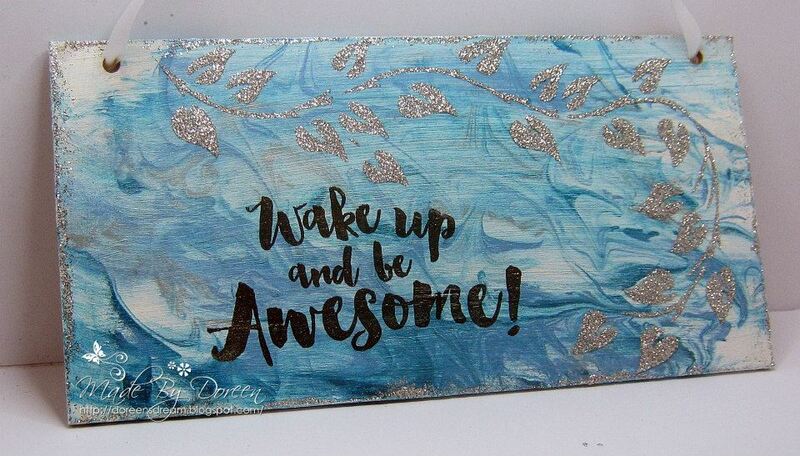 I used the small burst stamp with versamark, and glitter embossing powders in various colours, then added the large burst and the sentiment in a bright blue glitter embossing powder. I decided this wasn’t enough, so I heat embossed them again onto some heat resistant acetate, fussy cut them, then attached them with glue gel. Out came my Stickles for some extra sparkle !!!! On my second card, the stamps I used are Merry Little Christmas set, and the small flourish from Revolution. I made the background with Dylusion Ink sprays, then using the small flourish from the Revolution set, I stamped over it using just water, and flicked some for good measure, lol !!!! I stamped the tree and the sentiment using Black ink, then stamped the tree again in blue. 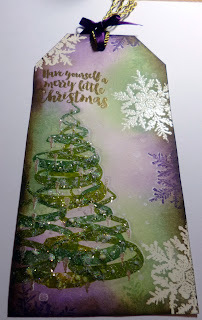 Once dry, I stamped the tree and sentiment again using Versamark, but slightly to the left, to give a shadow effect, then heat embossed in a white glitter embossing powder. Again I decided this was not enough, so I used some dries white glue over the main tree and the word Christmas, with some dry glitter sprinkled over it. Again I have a Christmas card for you today. I can’t stop creating Christmas themed projects, but the new Visible Image Stamps are so awesome! My background is colored with Neocolor II watercolor crayons and the lovely snowflake from the White Christmas stamp set. I stamped it with Memento Luxe matching the background color. 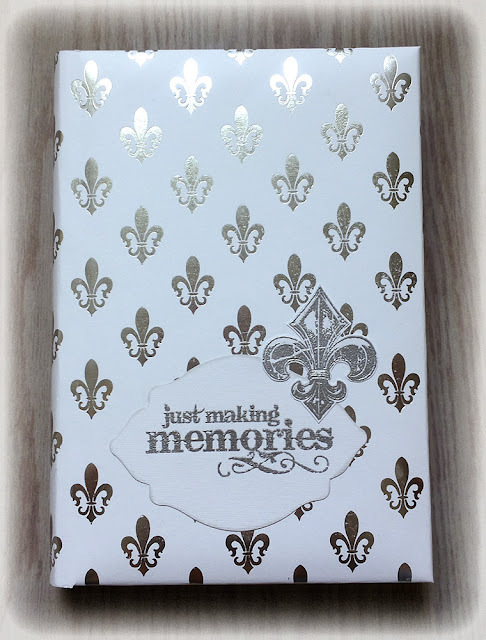 The sentiment is stamped with Memento Luxe as well and embossed with clear embossing powder. I cut it with the Silhouette Cameo and the Pix Scan Mat. I love the Poinsettia!!! I fuzzy cut each stamped flower and build up some 3d poinsettias. The leaves die cut in the background are from Cottage Cutz. For this card I first made a background using Distress inks then for a bit of dimension added a couple of background stamps.. Grunge Harlequin and Bronte Script. Last of all I stamped the Sentiment from the Sunshine Set. And for this Christmas card my background has been made with PanPastels while masking off a moon. The Winter Tree and Merry Christmas sentiment have both been clear embossed with Black Versafine ink, and I finished off using some acrylic paint for my snow. I used Aquatints to colour the background, just one colour brushed over wet water colour card. I did a couple of brushes across either side, leaving the middle pretty clear, the inks blended nicely in the middle. I used a stencil for the tiny dots then used Ink Splats stamps around the edges, heat embossed the Flower Inkognito and the Imperfection is Beauty sentiment stamp. I made my own stencil for this one, just a square nestie cut through mylar. I then inked through it with Diestress Ink, and stamped the snowflakes in the same colour. I heat embossed the sentiment. Only one stamp set was used which was White Christmas. I wanted to share a small project I made using my Visible Image Stamps. Lately I have been having fun making half-page canvas pieces. I love the torn edges that remain when removing it from the spiral book! The paper is Canson Mixed Media. The flowers are Tim Holtz Tattered Floral die cuts, colored with Derwent Inktense color blocks. The scribbles are made with UniBall Signo pens. 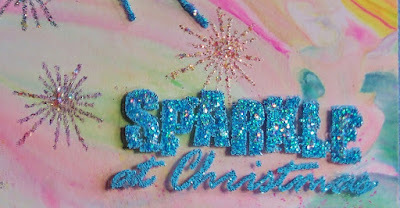 I used one of my favorite sentiments, Smile Sparkle Shine from the Express Yourself range for the focal point. I added Grunge Harlequin and Retro Dots background stamps for small touches as well, stamped with Stazon Black. Woweee! How awesome was all that?! Thank you so much ladies! We know you will be inspired to get out your Visible Image stamps and have a play! Or hop over to our shop and get some more!!! If you want to visit any of our Design Team blogs you will find all the links you need right HERE. If you missed our previous post which was also packed full of gorgeous inspiration, you will find it HERE! Don’t forget to show us what you have been creating with your Visible Image stamps for a chance to WIN a £25 coupon in our monthly ‘Show & Tell‘ challenge over in our Facebook Group! You can also find us on pinterest, twitter and instagram! Thank you so much for visiting our blog today! Hello There! Thank you for visiting our blog today 🙂 You will be very glad you did as we have an overwhelming amount of stunning inspiration for you! If you have joined our Facebook group you may have already seen some of these gorgeous cards and projects… Every single day of the week our awesome team bring you new inspiration! So if you haven’t joined our group yet you will find it HERE! You can also upload your photos of what you have created with Visible Image stamps for a chance to WIN a £25 coupon in our ‘Show & Tell’ monthly challenge! OK! Are you sitting comfortably? Then we shall begin! Guess what? 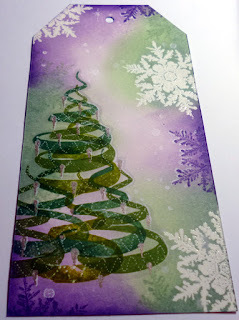 I’ve played with the brand new Christmas stamps from Visible Image this weekend! Whohooo, they are totally amazing if you like to play around with colors, papers, mixed media or whatever. My passion is spray mists and watercolors, so that is what I have for you today! The ”rockin’ around the christmas tree” card is colored with watercolors on watercolor paper. Randomly picked and brushed on wet paper. When it was dry I splattered a tiny bit of blue on top and then stamped the tree and the sentiment. Since it’s watercolor paper with a pretty rough surface you won’t get the totally black image you’ll get on smooth paper. I think it just adds texture to the piece, but if you want it perfect black – pick a smooth paper! Stamp set is called Rockin’ Around, and you’ll find it HERE! Then I’ve made a pink (!) christmas card. *gasp* But isn’t it kind of cool and pretty? Once again I’ve used watercolor paper, but this time with mists in pink and grey/silver-ish. Let it dry and stamped the beautiful collage stamp ”Christmas Collage” on top. Like the other card, since it’s stamped on water color paper it adds texture to the image since the paper is a bit rough. The big snowflakes are grungeboard that I’ve painted with white gesso and added glitter to. Notice the badge in the middle of the big snowflake? It’s home made, and I’ve stamped the snowflake from the White Christmas set on a pink paper, cutted out in the right size for the badge and put it together. Think it becomes a beautiful center piece. 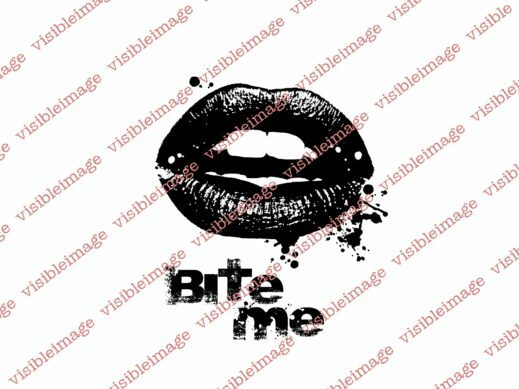 So I was playing with my stamps and I remembered the gorgeous lips in the Bite Me set so I decided to have some nice bright lips on a grey background.. electric blue lips would look so good here too but I chose to go for red and glittery! 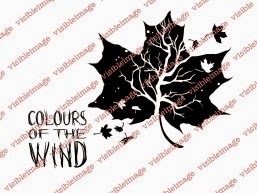 I have two different projects to share with you today, both using the fabulous Colours Of The Wind stamp set. 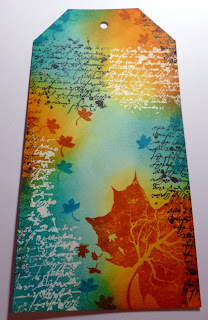 The first card uses the leaf stamp to create a beautiful background for one of the new sentiments.. 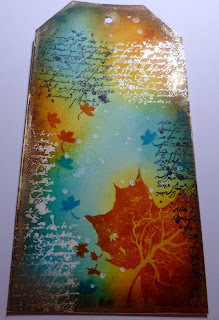 I inked up the leaf stamp with several colours of Distress Inks and stamped randomly on the page before embossing with clear embossing powder. I then applied Peacock Feathers and Black Soot Distress inks over the remainder of the cardstock, wiping away any excess from the leaves (the embossing powder creates a resist). I sprinkled some water over the card to create a splodgy effect! I coloured another piece of card with Distress inks and stamped the sentiment, then edged this and the background with gold embossing powder. My second card uses the leaf as the focus.. 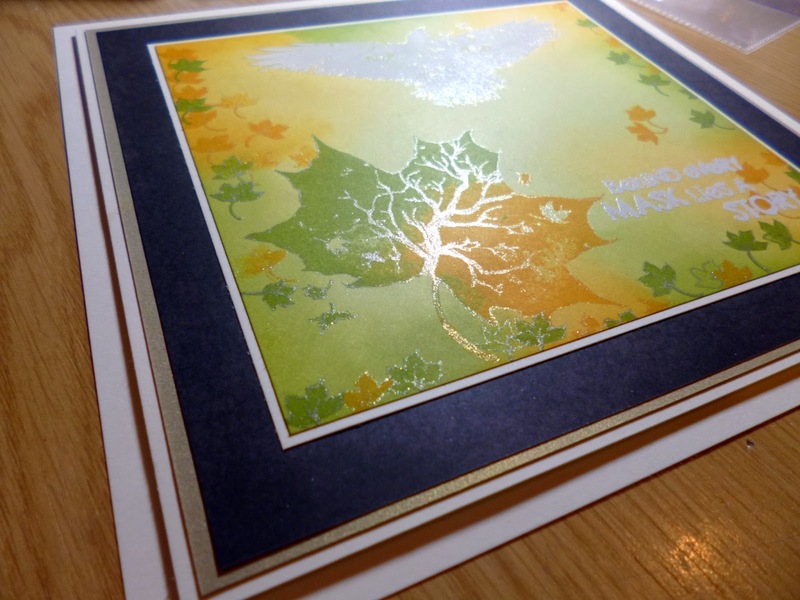 I used Brushos to create the splodgy background for the leaf, then embossed with gold embossing powder. 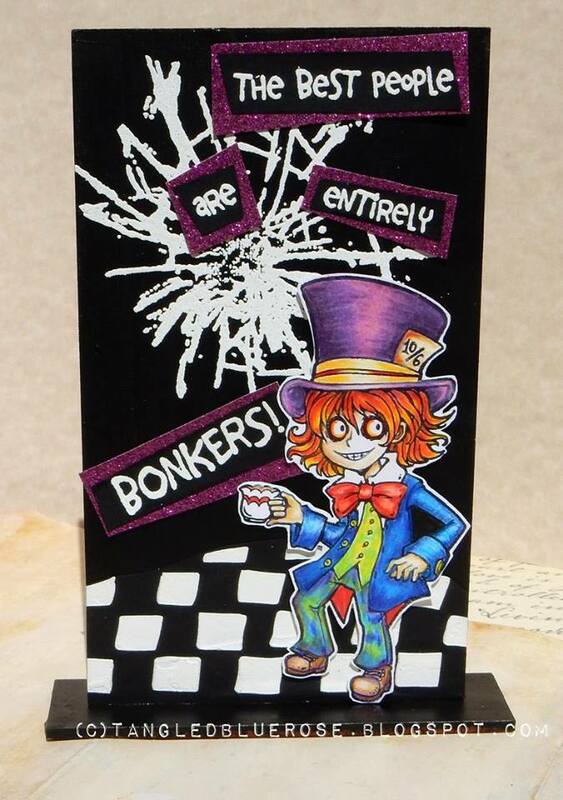 The bottom layer is coloured with Dylusions spray inks, and I stamped and embossed the sentiment in the corners. This is an Anniversary card I made 3 weeks ago, using a fabulous set of stamps from Visible Image, the Chandelier Set. I used a very old technique on this card, I won’t tell you how I did it, as I shall be using it at my next workshop, but it does make your main images pop! 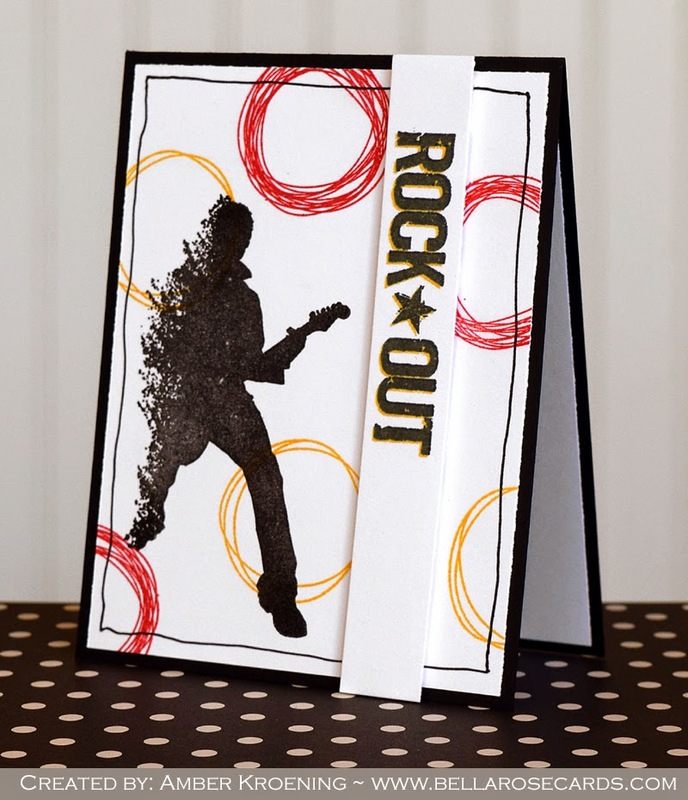 I used the brand new “Rockin’ Around” stamp set from Visible Image for this card. The tree and the sentiment are stamped with Memento Luxe ink and embossed with clear embossing powder. To bring some dimension to my card I added all of my layers with dimensional foam pads. The tiny trees are cut with a die from Marianne Design. The red background is painted with Neocolor II watercolor crayons. I love this stamp set!!! It’s so modern and very funny! I am back with some inspiration using the gorgeous Visible Image stamps. I have brayered some Acrylic paints onto some tissue then over stamped with Grunge Harlequin. I then covered another piece of white card with the distress ink and white embossed the sentiment and edge.This was then attached to the backing using foam pads. And for my second card I’ve been playing with Brushos again……. still loving them! We will be sharing Kim’s tutorial here on our blog over the weekend! I deliberately went colour crazy with these! I just love the hot red which contrasts with the icy cold sentiment and the white embossing powder I used. I started as I nearly always do by colouring some card with Brusho paint powders made into a liquid paint. A little pinch of powder in a spot of water goes a long way! I painted red, orange and yellow using a broad flat brush. When this was dry I used the snowflake stamp with a dilute bleach solution first. Once dry I over stamped with a hot pink ink just off centre to make the image look 3D. I then added more snowflakes in red all over the card. I stamped the sentiment onto a dark red piece of the painted card with white embossing powder before matting and layering with white card. The turquoise and purple card uses white embossing powder instead of bleach. I then used 2 shades of turquoise for the other snowflakes. I distressed the edges of the pieces of card by running my scissors down them and used a pin-wheel to give a faux stitched effect. I also used 2 sizes of white brads in the corners. If you visit my blog often you will know that I am a frequent user of string! I love adding little knots to break up the long lines of string. Oh, hey, wait…. is that orange? With a touch of turquoise? Yep! It is, and it is a christmas card!! LOL Why not? Got a crazy feeling of mixing some non traditional christmas colors and I think it become pretty nice! I’ve played with some new and some old Christmas stamps. The orange (cool huh?) card is made with brand new stamps. Snowflake is from the set called White Christmas, and the beautiful verse is called Christmas Memories. I’ve worked on watercolor paper and just randomly dripped color from mist bottles in orange and turquoise / teal colors. Dryed and dripped again and round up with just mists of water. Continue until you like what you see… not more complicated than that. I stamped my snowflakes and the verse and then draw a frame (line) around my square of color. Finally I added glitter glue to the snowflakes to have them sparkle. For the brownish card I actually used my spray mists as mists! It’s gold and some moss green blended. I dried it with my heat gun and stamped the Christmas Colllage on top. As the paper it’s a bit rough the image will be a bit ”distressed”, just keep that in mind! Finished it up with glitter tape and a button. The sun may be shining but my thoughts are turning to Christmas this week. This superb Sparkle At Christmas stamp set from Visible Image is perfect for a classically elegant card. 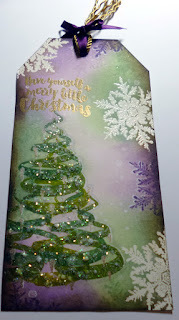 I stamped with Versamark ink and used Heat It Up Silver Tinsel embossing powder – I love the glittery bits….so hard to photograph though! I’m sharing a card I made recently for Mark Alexander’s Birthday! He is the designer, creator and maker of the awesome Visible Image Stamps. I used Man INKognito, the script from Revolution, and the finger print stamp from the brilliant Drag & Drip set. And using some of the Visible Image sentiment stamps, from various sets, I stamped my own message !!!! and Love You to Bits from the Zombie Brian Set. If you want to visit any of our fabulous Design Team blogs, you will find all the links HERE! There’s still more to come, so we will be sharing that over the weekend along with the tutorials we promised you. Don’t forget that you can find us at many of the Autumn craft shows here in the UK, all the details you need are HERE! There’s still time to grab yourself an amazing deal in our 30% OFF SALE too! It ends this Sunday (August 30th). We are sure that by now you know that our stamps are superior in the stamping world! So thick, so deeply etched, and so unique! Make your Christmas cards stand out from the crowd with our brilliant new designs… Go wild with colour! You’ll find all our gorgeous stamps right HERE! See you tomorrow with more awesome inspiration from our amazing team! It’s my day to play with Visible Image Stamps, and I had lots more fun! I carried on with my mail art, it is so fun! Hope you give it a try…so many possibilities! 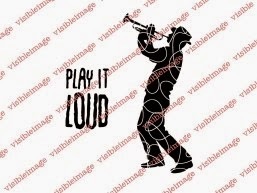 I stamped the image onto Neenah cardstock using Ranger Jet Black Archival ink. I love the rich, deep black and it is waterproof. This is colored with Distress Inks, Spiced Marmalade, Abandoned Coral and Wild Honey. I sprinkled water droplets when the base was dry. I used Mermaid Lagoon, Peacock Feathers and Cracked Pistachio Distress Inks. Life is a Journey is from the This is Me set. I splattered some Distress Paint once everything was dry. I added a flap liner using some random papers. The back side of my orange envelope shows more stamps I used. I loveeeee the dots I made by generational stamping with part of the Plasma stamp set! Also, I edged the flaps with the line from the Drag & Drip set. Thank you so much for coming by, I hope you have a fantastic week! For everyone that likes to plan early, take a break from the heat with the NEW Visible Image Holiday stamps, pre-ordering July 10th! They are really wonderful and true must haves! You will find more of Kim’s awesome work over on her blog. So that’s another week of superb work from the team! If you missed any of the last week’s posts, you’ll find them HERE. Enjoy the last part of the weekend and we hope the sun is shining where you are. Good Morning! Hope you are enjoying this week’s inspiration from our awesome Design Team! Here we are again for another dose of Thrilling Thursday inspiration – hope you have been enjoying the mini heatwave here in the UK….it’s far too hot for me at the moment but I do like to see a bit of sunshine as it lifts the spirit!! This week I have decorated a pair of mini framed canvasses using some of the brilliant new word stamps from Visible image. I started by using some modelling paste through a circle mask in the corners to add some texture, then dripped washes of paint down the canvas once the paste was dry. I used some black paint through a chicken wire mask for a bit more detail, then got out my stamps. I used black embossing powder on the words and circles (from the Universal set), and gold embossing powder on the Woman Inkognito. A bit of gilding wax on the stencilled circles added more shine! The frames are painted to create an antique brass efect which tied in with the ‘distressed industrial’ feel of this piece. I love how this turned out and the words are perfect for anybody contemplating a new start in life…. Oh wow! Aren’t these canvases amazing! Love the colour tones, and texture. That gold on the browns is divine <3 It would make an awesome gift! What would you create with these inspirational words? To see all our NEW releases, head over to our shop! Check out our INKognito stamps… they are so versatile! And if you don’t have our Universal set yet.. you NEED it!!! Elena will be here later today too with another gorgeous project! Does your local craft shop stock our stamps? If not, we’d love it if you told them about our unique stamps… and of course how much you love them! It’s time for me to show you some more projects using stamps from Visible Image. I made the background on my Gelli Plate using acrylic paints, and a couple of background stamps. I then stamped Woman Inkognito in Versamark and heat embossed with black embossing powder. I did the same with the sentiment. For the background on this one, I used the ‘Shaving Foam Technique’, if you haven’t tried it you must, it’s so much fun. The sentiment is one of the brand new releases, available now here at Visible Image. I stamped the butterfly twice, once on the card and again on a piece of acetate, which was attached by the body and the wings bent up just a little, and finished of with gems. Pop back a little later to see what Kim J has been creating… it’s stunning! I am back with some inspiration using the gorgeous new Express Yourself Visible Image stamps. 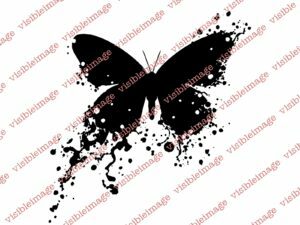 I have made a background of Distress ink that I have splashed with water, my Butterfly INKognito was stamped making sure I left enough room for the words, I then stamped my sentiment “Take the Moment” with black Versafine ink and clear embossed. Last of all I stamped the Large Butterfly, coloured with distress ink and fussy cut it and stuck this down with some foam pads. Thank you Doreen 🙂 Gorgeous backgrounds for these fabulous words! You’ll find more of Doreen’s beautiful work over on her blog. And don’t forget to show us what you have been creating with our stamps over in our Facebook Group. There’s a chance to WIN a £25 coupon in our Show & Tell challenge! Today I’m sharing some projects I’ve made, using some of the new ‘Express Yourself’ sentiment stamps from Visible Image. I had great fun making these, and used various crafty products whilst creating them. This is a 8″ x 8″ hardboard plaque, the stamp I used is….. The next one is a 8″ x 8″ canvas board, and the stamp I used is…. Wake up and be Awesome and Butterfly. The stamps I used on this 7″ x 7″ card are…. Take the moment and the flower from the Thank you Set. No Space for Dreams, and Classic Face. And a couple of tags, this one uses…. 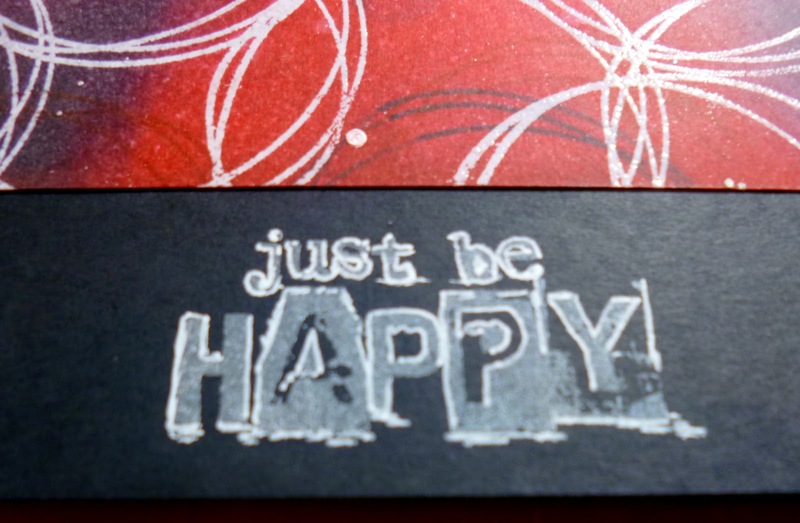 Time to be Happy, the birds form Free Your Imagination, the smiley face from Robot Data Set and the edge stamp is the free flourish that came with the Craft Stamper magazine. 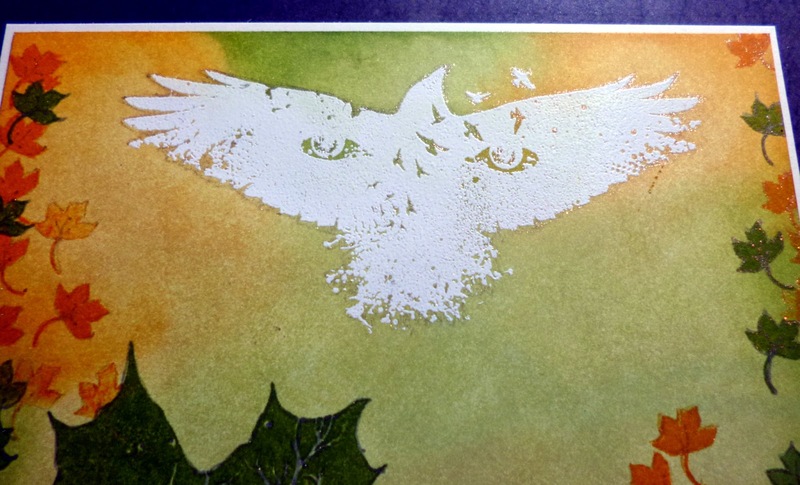 Last one is……If you have Hope, and again, the free flourish that came with the Craft Stamper magazine. 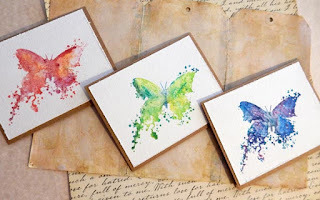 I hope these projects have given you a bit of inspiration, and I hope also that you have started making a creation for the ‘Show and Tell’, using Visible Image stamps of course, for a chance to win some new stamps. 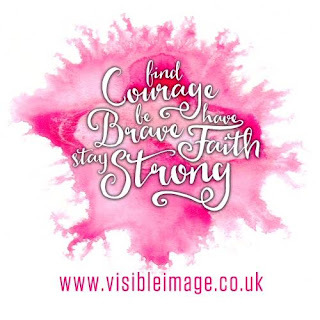 Visit our ‘Visible Image Facebook Group‘ for all the gossip and loads of questions, banter and inspiration. Thank you for visiting, only 9 sleeps until I go on my holibobs, yipeeee. Woweee! Amazing projects from Pauline… so colourful as always and showing how these NEW stamps work brilliantly with some of our older designs. You can find more of Pauline’s work over on her blog. Pauline will joining us on many of our show stands this Autumn, demonstrating our awesome stamps… so excited about that! 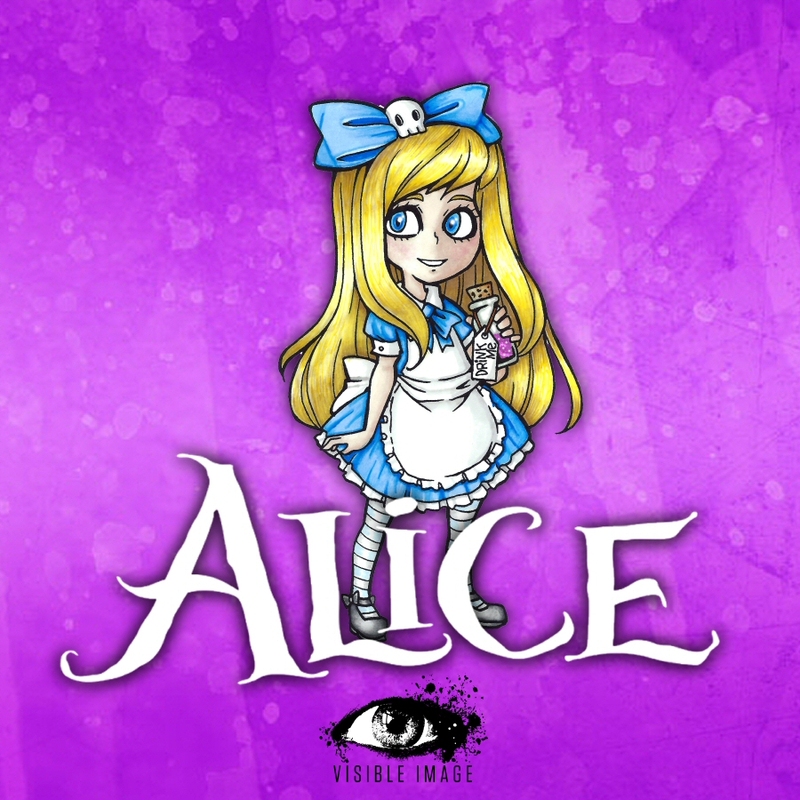 We’ll be back a little later with some Wonderland inspiration from the amazing Susanne Rose! And Doreen OBrien has some absolutely stunning ‘Express Yourself ‘projects to inspire you too.Have a great Saturday whatever you are doing… we will be mostly decorating! Good Evening! Another busy busy day is almost coming to an end here, so it’s time to take some time out from stamp making & packaging to show you what our awesome Design Team have been creating to inspire you this week! inky script from our Revolution set. the awesome melting clock stamp from our Time is Precious set. of your card or project 🙂 our NEW The Best Days stamp is such a positive quote! on your wall.. something to see when you wake up! Amazing card created by Teresa with our Alien Invader set! It’s just so realistic 🙂 Fantastic scene! Another superb card by Teresa created with our Robot Data set. Mark created the Happy Birthday sentiment and smiley face stamp to fit perfectly on the screen. We hope you have been inspired 🙂 Our NEW stamps our flying out faster than the speed of light!!! Have you ordered yours yet? You can find all our NEW releases HERE! We’ll be back tomorrow with Pauline Butcher’s fabulous Friday post. Feeling a little sad today as we say goodbye to the very awesome Amber Kroening! Amber has been on the team for the past year and a half and we adore her style! Happy Saturday! I went a little crazy with this card and used a bunch of different stamps. It was fun to make! The background was done with watercolors. This is my last post with Visible Image and I just wanted to say that it has been a delight to be a part of the team. Mark and Helen are fabulous, and all of the design team girls are so sweet and talented!!! Our NEW Design Team members will also start to share their new cards and projects with you this coming week! 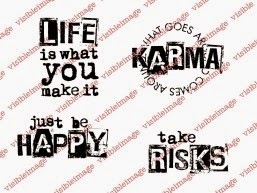 Lots of awesome NEW quotes stamps coming very soon too!!! Visible Image stamps – latest DT projects! We are back from a fabulous week in Majorca, thoroughly rested, relaxed and tanned! Beautiful card featuring our gorgeous Alice In Wonderland character stamp. More details on Lisa’s blog. Awesome card created with our Imagine Dream Inspire set, one of the brilliant quotes from our Be Happy Set, and our Mystical Map. There’s a fantastic step by step over on Kim’s blog. A fantastic set of cards created with two of the characters from our fantasy collection.. Fae Hope and Myrddin Magick. More details over on Teresa’s blog. Stunning card created with our beautiful Angels Are Near set, and our Universal Background stamps. 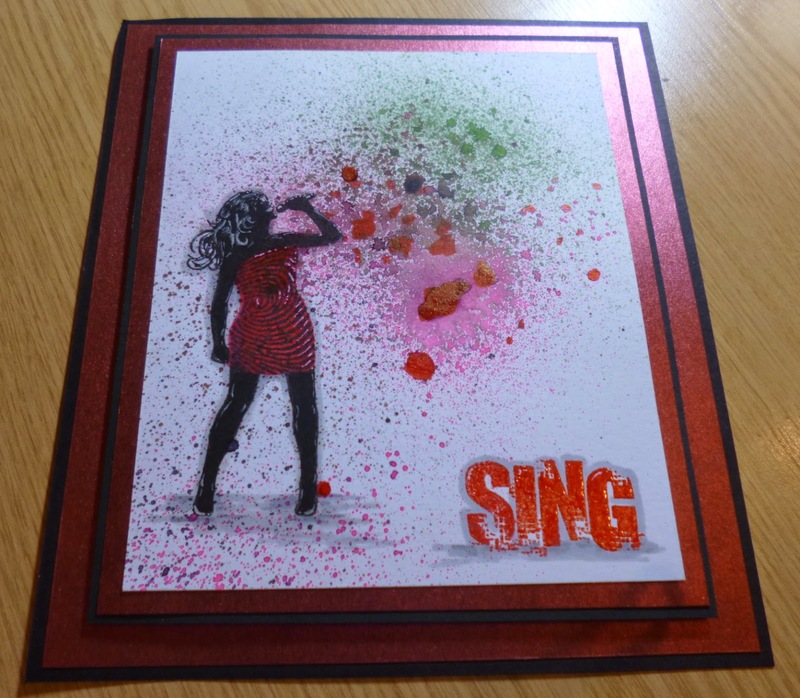 Gorgeous card created with our Sing set and Universal Background stamps once again… such an awesome and very versatile set of ‘must have’ stamps! Come on over to Pauline’s blog for more details and photos from our workshop day in Bristol. 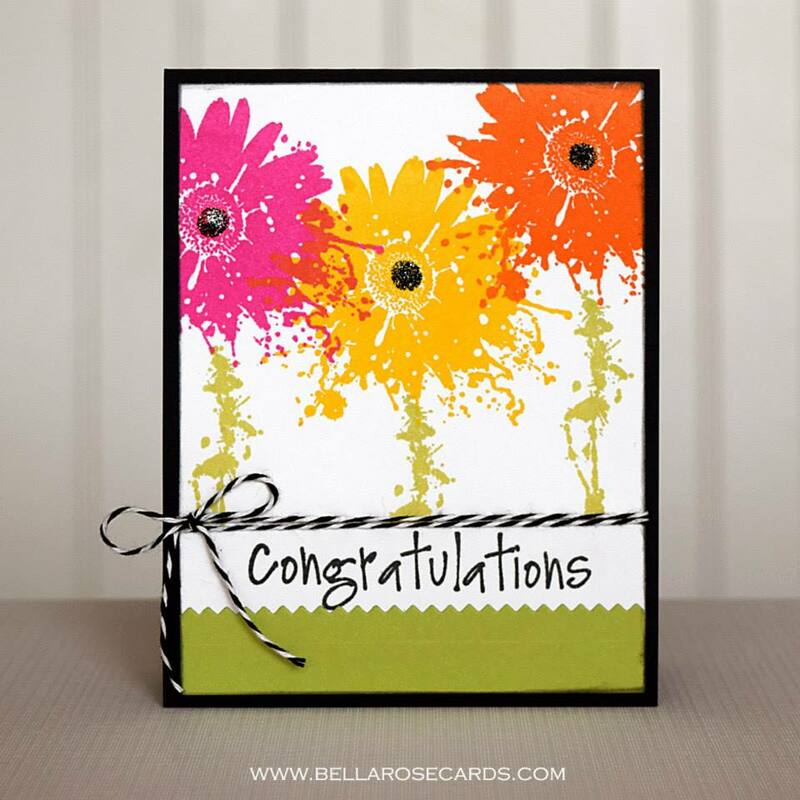 Stunning card created with our unique Flower INKognito stamp, with our Congratulations sentiment. More details on Amber’s blog. Amazing card created with our Leave Your Fears stamp set, and Grunge Polka Dot background stamp. More details on Kim’s blog. Stunning tag create with our Angels Are Near set. More details over on Sue’s blog where you can find out how she created this amazing background! Amazing card created with our Vintage Car, a quote from our No Regrets set, Bronte script, and Tyre Marks. Awesome canvas featuring our Rock Out set. More details over on Lisa’s blog where you can see how Lisa created the amazing texture! Stunning book folding sculpture featuring our Large Butterfly stamp…. WOW! Come on over to Teresa’s blog for more details. We are getting rather excited about our next NEW stamps release… just two weeks to go! This time we will be bringing you more unique character sets, and once again something missing in the craft world right now!!! The image I’ve used – the dragon – is from Orin Destiny Set. It’s easy to miss that the characters often have totally lovely stamps as accessories. The word stamp is named These are the Moments. I’ve used an edge scraper around the paper, and then lightly added black from an inkpad. When it all was mounted on the base I put the glitter glue on around the rough edges. You will find all the amazing Visible Image Design Team inspiration over in the Facebook Group where you can enter our ‘Show & Tell Challenge‘ for your chance to WIN some awesome Visible Image stamps! And don’t forget to LIKE the Visible Image FACEBOOK PAGE too. Love this! What a perfect background for our dragon… very fiery! Fabulous! 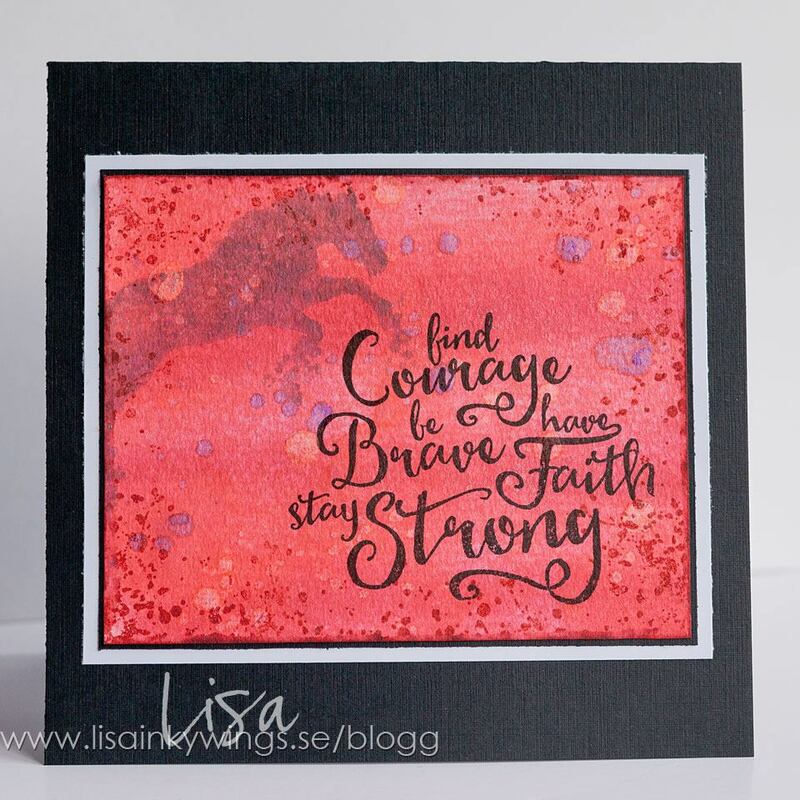 You’ll find more of Lisa’s stunning work over on her blog. WOW! WOW! and again WOW! By all accounts the Bosses had a mega time at Ally Pally over the weekend! Did you go? Did you meet them? What did you buy from the Visible Image stand? Oh I am soooooo nosey! Maybe you will show us what you make in the Show and Tell soon. yes? Right, today I have for you a bright little card I made using one of my favourite images, the butterfly. Not the INKognito butterfly that I usually use but the traditional butterfly. In fact I used both the large and the small one on this card. I started by simply stamping directly onto a piece of white card with the 2 different colours of dye based stamp pad to create the block background. No stamp, just use the ink pad as the stamp. I left a bit of white space and kept the pressure to a minimum so as not to squish too much ink out from the pad. Once this was dry I used a very dry brush with white gesso to mute the colours further. Taking the mini dots stamp I then stamped in both colours over the dry gesso. Butterflies were also added in the 2 colours. Using Stazon in Dark Cherry and black I stamped a big and a small butterfly onto acetate before cutting them out and sticking them to the card base using a clear silicone glue. The sentiment was stamped onto another piece of the card in black ink and mounted across the card. Click HERE to find out about the monthly Show & Tell challenge – It links to the group where you can upload your projects and tell us all about them! Come back a little later for something rather bright and funky from Pauline Butcher! We are playing catch up after our time away at Ally Pally! Lots of stunning new cards and projects to share with you. If you have got your hands on the latest issue of Craft Stamper magazine you will know that the free cover stamp is a mini Grunge Flourish designed by Mark! Pauline Butcher and Kim Bacon created some amazing projects with this awesome little stamp, and they are featured in the magazine. To be going to Ally Pally on Sunday, which is also my Birthday! Whoooo hooooo! 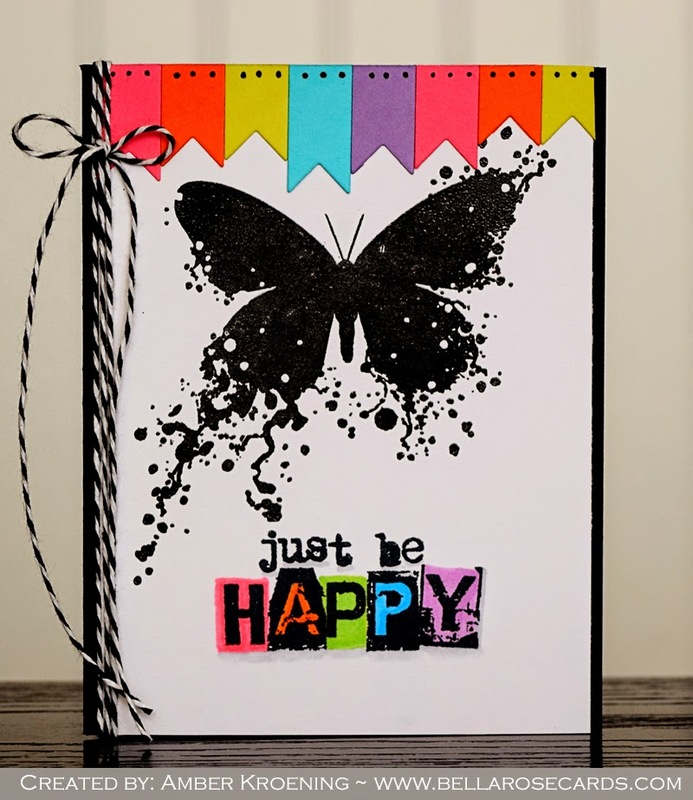 On this tag I used the free Visible Image stamp, which comes with the Craft Stamper, plus….Butterfly and Just be Happy from the Be Happy set. On this 6″ x 6″ card again I used the free Visible Image stamp, which come with the Craft Stamper, plus… Express yourself with Art from the Never Grow Up set. All the details for making these creations are in the magazine, so I won’t go through it all again, lol, but I hope you enjoyed the article. Thank you for popping in, and if you’re going to Ally Pally on Sunday, please stop me and say Hi. Two amazing projects from Pauline… LOVE the tag <3 And the card is so bright and cheerful 🙂 They both look absolutely stunning in print! We will be back tomorrow with the latest inspiration from Amber, Kim Bacon, more from Pauline, and new makes from Lisa and Kim R !!! See.. we told you there was lots to catch up on! You are in for a treat today, not only is it double the inspiration as always on our ‘Wonderful Wednesdays’ but today Kim and Lisa each have 2 amazing cards to share with you! Today of course is Visible Image Wednesday and I have another card to show you made for the recent Trade show at the NEC. Is spring here ? Or not? Can anyone tell me, this is today’s posable question folks lol. Last week it was so warm the heating went off the duvets got changed etc etc… the last few days the heating went back on and it feels like we have gotten cold again lol! Is it just me or is anyone else hoping that the recent warm spell was spring starting to smile upon us… and and and my neighbour has finally cut the top of their trees after 5 years with absolutely no light in the garden hardly at all so this summer there will be sunshine….. we hope haha.Anyway enough of this silliness hehe. It is certainly a little different isn’t it? We were kinda challenged into stepping out of our comfort zone in a way by using a whats considered to be a backing stamp and a sentiment to make up a card. Well I immediately thought this was a fabulous idea these stamps are such such such good value and I know we all have a budget to follow so why not take a stamp, thought of in one way and turn it on its head. 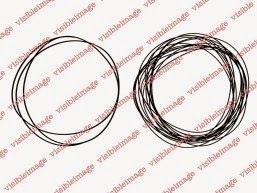 This of course is the card that I started with and the circle stamp is called Orbital , there are two different ones in the pack and I think I showed the other recently which has several circles rather than this one. I thought this one would be absolutely perfect for those of us who enjoy mixed media and Journalling also as this kinda circle is so popular also I don’t know if any of you use the Gelli plate but stamps like this are fab to mark out on your base of acrylic paint before picking up a print so you could have the first print as patterns of circles and build up til you were say stamping an undersea image and the circle became a coral reef etc. Just thoughts. Back to today’s card, This was the sentiment I chose from the last launch sentimentally yours and the Be Happy set which is stamped in of course white ink and then I went over and highlight in a white gelli pen and added highlights on the shadows too to ground it. I then took those same inks and tone on tone stamped with the same stamp in the coloured area so red on red , black on black and dried this off with the heat gun. I then took my water spray and flicked water and spritzed it some big splodges some small and dabbed the ink away with a paper towel. As we were not to use more stamps I still wanted some depth to come in so I also took an old white chalk pen and flicked it at the card and added random splodges so in person there are still many layers to look at in this one. I then mounted that onto a piece of black card the same width and wrapped a little grey ribbon around the join. I also added a double white mat with foam in between to give it its finished platform as it were. I added a bow and a little charm to its centre. 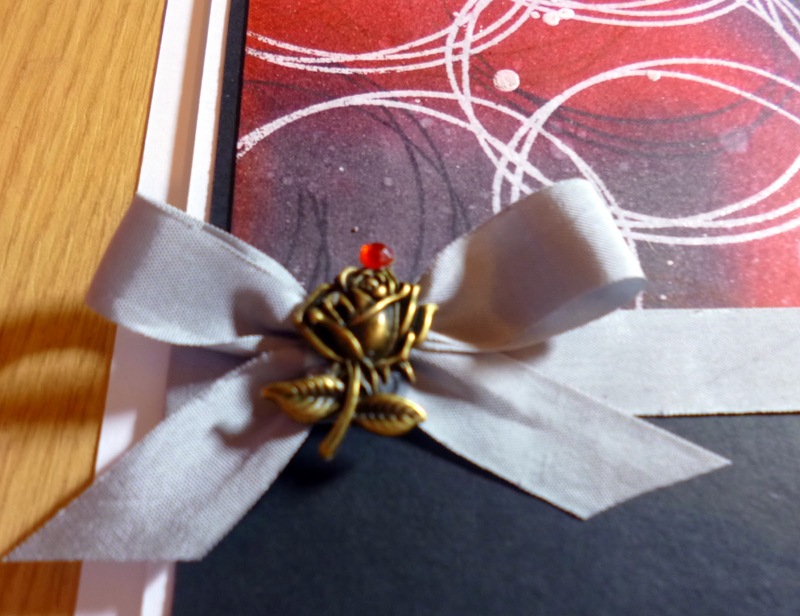 Here is the finished bow and a little rose charm with a red stone in the little bale at the top , I used some pinflair glue here to hold it to the bow as that stuff dries and you will never get it off which is what you want especially when these cards are on display a lot. So I finished it with little squares of gems in red in each corner just for something different. I used some vintage Photo distress ink and went round the edges of the paper and used a brown spritz to splatter the paper and some sepia ink and white ink to dot it too. I also filled in the pattern on the player with my white gelli pen to make him stand out. Since I stamped in Momento I took an alcohol marker from Promarker in a very light grey and went round the main image and the music notes I added shadows and also to a few main splodges etc to lift things off the page , I grounded the main image also with a shadow by his feet and added some sparkle to the hat, shoes and trumpet in gold. The background I put together using random small pieces of paper I thought was a little manly and musicy (new words , sorry guys lol) and piece them together on a black mat and added a ivory ribbon in satin to the first layer too. I gave the bottom layer a couple of mats in dark colours and added a bow to the left with a tiny trumpet I had in my stash to the centre which i thought fitted very well. I drew some faux stitching by hand in black pen round the paper and a few gems in the corners and on the ribbon finished off this little I’d say intermediate level to make card. A close up on the shadow placement around the main features I wanted to come forward. And the main image again , I like to think it looks like it was back in the era of American Jazz and a little Vintage inspired for this guy. The two stamp sets I used on this one were. So this was a great card for a guy or anyone who isn’t into flowers and girly stuff , also maybe someone in a production or play, My son did Bugsy Malone when he was at school and this would have been a great card to wish him luck I think. I just added it as a bonus to today’s post rather than a full write up with lots of tutorial pics so I hope you like it. I hope everyone had a wonderful mothers day over the weekend or had wonderful thoughts of the ones we love who are sadly now passed . I had a lovely Saturday with my daughter in London, and a nice long chat with my boy on the phone Sunday, and so those moments are the ones I treasure so very much. Aren’t they both fabulous! The white orbital circles look fantastic against Kim’s red background. The trumpet player looks superb with those touches of gold. You will find more of Kim’s amazing work over on her blog. Hi there! Thanks for coming to see us here on the Visible Image blog today. Hey guys! Visible Image has a TON of new stamps! On today’s card I used Bite Me. =D How cool is this little stamp set!!?? I started by lining my card base with black and white polka dot paper. Next I stamped my lips and sentiment, and heat embossed them with clear embossing powder. I trimmed it down to size, and used a black marker to add a thin border around the edge. I added a black and white twine bow, matted this layer with pink cardstock, and adhered it to my card. Don’t forget to join in on our March Show and Tell! For more Visible Image inspiration check out the Facebook group, and Blog homepage. We’ll be back tomorrow with another week of amazing inspiration from our fantastic team. Hi There! Thank you for coming to visit today. Yesterday came and went so fast there was just no time to blog! 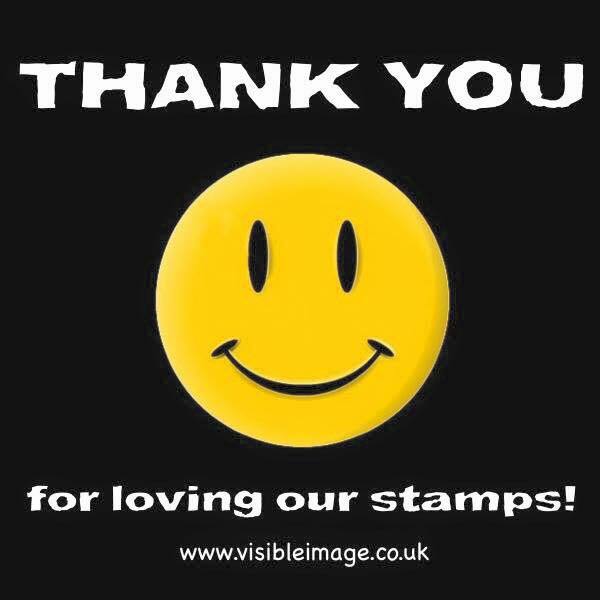 Woweee you are loving our stamps… that makes us very happy indeed! So today, we will have three posts! 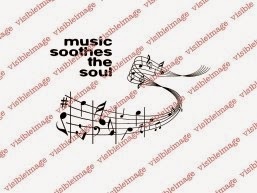 Yes treble inspiration for you all created with our gorgeous stamps. A huge good morning to you all on this fine day . Well I am hoping we have another full day of sunshine today and bright sunshine. It was so good to see the yellow balll in the sky yesterday and my little friend of the kitty kind from over the way was laying in the garden all day with her mum and sister… it looked like kitty central dor a while. haha. So today is The One and only Visible Image Wednesday and I have a twofer for you all which I hope you will enjoy. This first one I love with its Autumnal shades and just that it really is something a little different. So without further ado card number one looks like this. It features two of the recently launched new stamp sets and some matting and layering of course and some white embossing so it couldnt be any simpler for quick makes. So I took a white piece of card and started laying down some Distress ink onto it in my usual way and I decided to keep it quite light and pretty but of course the first layer is always a little patchy pshing the colours into the fibres of the paper until it soaks in and you get a nice slip for the next layer. I added a second coat using the same Wild Honey and Shabby shutters ink but intensifying the edges a little more. At this stage I spritz the card with some water too , I used a very fine spritz so I could get a nice slight mottle to the card by patting the water back off with a piece of kitchen towel. I did go back and drop some larger water droplets on it in the same manner and blot the ink off. I then dried the ink really well with a heat gun and also rubbed my anti-static pad all over it to make sure it was really dry as we were going to use embossing powder next. So I took the main image from the Behind every mask set and inked it using Versamark ink and placed it on top of the inky background in the top middle of the card and pressed really well to make sure I got a nice sharp image, I tipped on some white embossing powder and heat set. Next I took the large leaf from the Colours of the wind set and inked it using the same inks as on the background but one side was the Honey shade and the other the green, I also added some darker shades on the edges too and stamped it on the lower left corner, I pulled it off fairly quickly as I wanted it to look like it had a stippled pattern on it so I went in and out really quickly with it. In this stamp set there are several smaller little leaves which you can keep attached or snip away from the large leaf. I chose to snip one away and use it to stamp the pattern you see in the corresponding colours keeping it tone on tone mostly around the edges of the card. 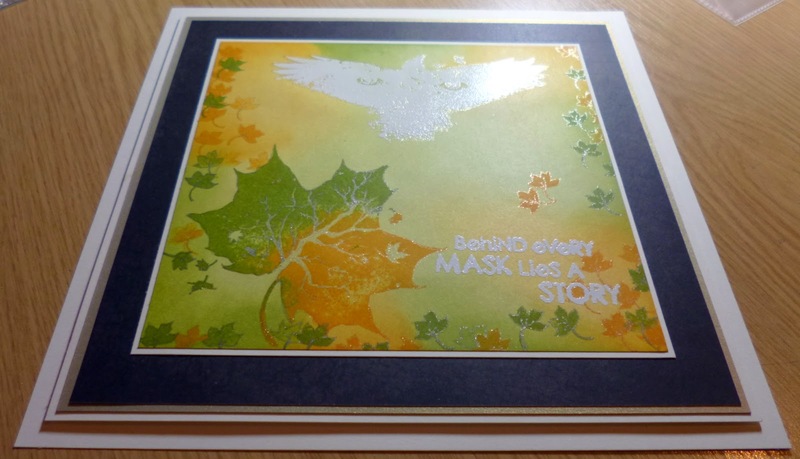 I again dried it all and used the anti static pad before inking up my sentiment from the Behind every mask set which says, “Behind every mask lies a story” I used again the same white embossing powder to make it stand out and heat set. At this stage it was really done so I took a Sakura Stardust gel pen in gold and highlighted the leaf and the edge of each of the smaller leaves and round the edge of the bird and anywhere I wanted to pull slightly from the page. I took this picture as it showed the light bouncing off the gold on the centre of the leaf, it is very difficlt to get it to show on camera but holding it it sparkles very subtly but soooo pretty. I also took a white ink and flicked it at the paper with a few very tiny drops and the same with a sepia colour. Then the rest of the card was just about matting and layering as you can see here. The two stamp sets I used were. The next card was something completely different for me but still with my style I think. I took a piece of white card much more rectangle here and using the SING stamp set I stamped the young lady in black Versafine Ink onto the bottom left of the card, I dried her with a heat gun and then took some ink spritzes in a pale pink a green a dark grey/mauve and a red and one at a time and drying in between spritzed the colour in one section on the top right, I let it wick out a little and dried it completely I then stamped the SING out in red ink on the bottom right and dried it again. I took my promarkers out and coloured the dress on the girl and kept it darker on the left of her dress. I took a white pen and added lots of highlights on her hair and dress , legs etc I also took a couple of Ice grey promarkers and gave her a shadow to ground her and stop her looking like she was floating. I also did the same to the word SING on the bottom right. I also added some white flicks and things to the ink stain. I chose to keep the matting simple in shiney red and black card to finish off this look too. So I hope you enjoyed todays little twofer and you enjoyed me having a go at something a little different. I hope you will have a go too and don’t forget there is soooo many sources of inspiration here on the Visible Image blog from the whole team, and on the Facebook page if you prefer that route. The stamp set on this one was of course this one. Two stunning cards from Kim. You will find more of Kim’s gorgeous work over on her blog. We’ll be back with some ‘fantasy’ inspiration from Lisa next! Good Evening! Thank you for coming to visit us today here on the Visible Image stamps blog. We had a fantastic time at the CHSI show at the NEC! It was great to see lots of our fabulous customers, and to meet and chat to so many people. We hope you have been inspired! Come and join our Facebook Group where you’ll find our daily inspiration, you can share your Visible Image cards and projects, chat, and enter our monthly show & tell challenge! Hello and thank you for coming to visit our blog today! First and foremost, I want to wish you all a really Happy New Year!! I am so eager to kick off the year with a new project for you. This time I created an ATC card using stamps from Visible Image. To those who do not know Visible Image yet (where have you been living!?!? LOL JK), they are a really sweet and talented company from UK that supply a variety of really good quality stamps. 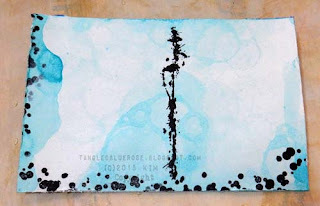 To create the backround, I simply added few strips of washi tape onto the cardstock cut into an ATC size — then I covered it up with a generous amount of gesso. I let it dry and then added Gelatos. When everything was dry, it was time to stamp!! I took the Bronte Script and without using the acrylic block I stamped here and here, I did the same thing with the Crackled Background — but using a third generation stamp because I wanted to create a soft look. 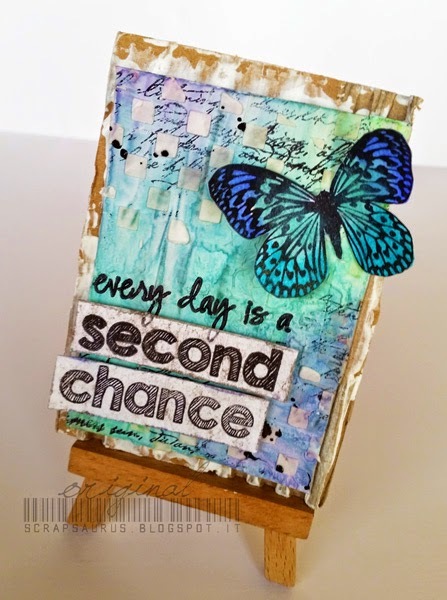 I stamped my sentiment covering the part where it said “second chance” and stamped it into the background using Stampers Big Brush by Faber Castell. The “Second Chance” was stamped on a separate piece of white cardboard because I wanted to add dimension to the sentiment. I stamped the Butterfly on a separate cardboard too, colored it using Gelatos again and I fussy cut it. Before adhering everything, I added some more texture using a stencil and Whipped Spackle by Design Memory Craft. Then, when everything was completely dry, I glued every piece together. 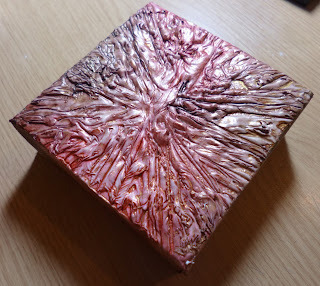 To add even more texture I decided I wanted to glue the ATC over a piece of recycled cardboard that I covered up with a bit of gesso to make everything connect. I hope you will like the result, as always for any comments, questions, suggestions etc etc please leave a comment HERE ! We have a NEW challenge for you over in our Facebook Group so be sure to come and JOIN US THERE! It’s a special post today! We asked our Design Team to choose their favourite card or project created for us in 2014! And we have selected our two favourites….which was SO hard! This canvas is also Kim’s favourite! This canvas is also Sam’s favourite! Although Teresa hasn’t officially started her new DT position with us, she has been busy entering (and winning) our challenges this year! We have had such an amazing year but we plan to make 2015 even better! 😉 We have lots of awesome NEW stamp designs for you, our first release will be in February and it’s going to be BIG! Very excited for the Stitches Trade Show!!! You will of course find all these stunning stamps HERE! Why not treat yourself… it’s Christmasssssssss! We will be back tomorrow with Fabulously Festive Friday inspiration from Pauline Butcher to finish the year! Our Design Team are taking a well deserved 2 week break over the festive period, and we will be back on Saturday January 4th 🙂 Very excited to see the first ever Visible Image creations from Zoey and Lisa! Hello and thank you for checking out our November Challenge here on the Visible Image stamps blog. 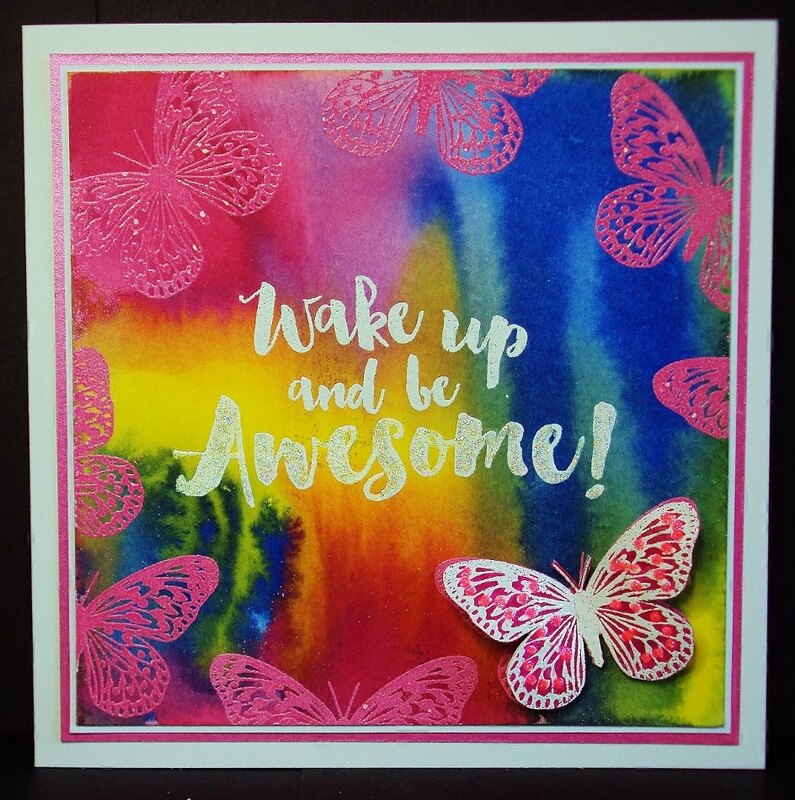 Sam created this amazing card using our Butterfly INKognito stamp and Where Dreams Take You sentiment. 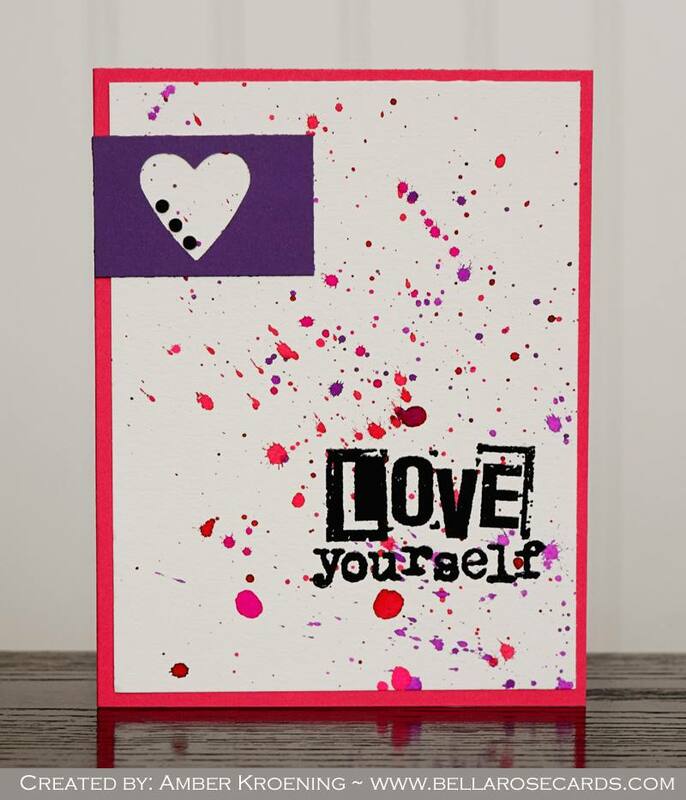 This card is featured in the latest issue of Creative Stamping magazine! 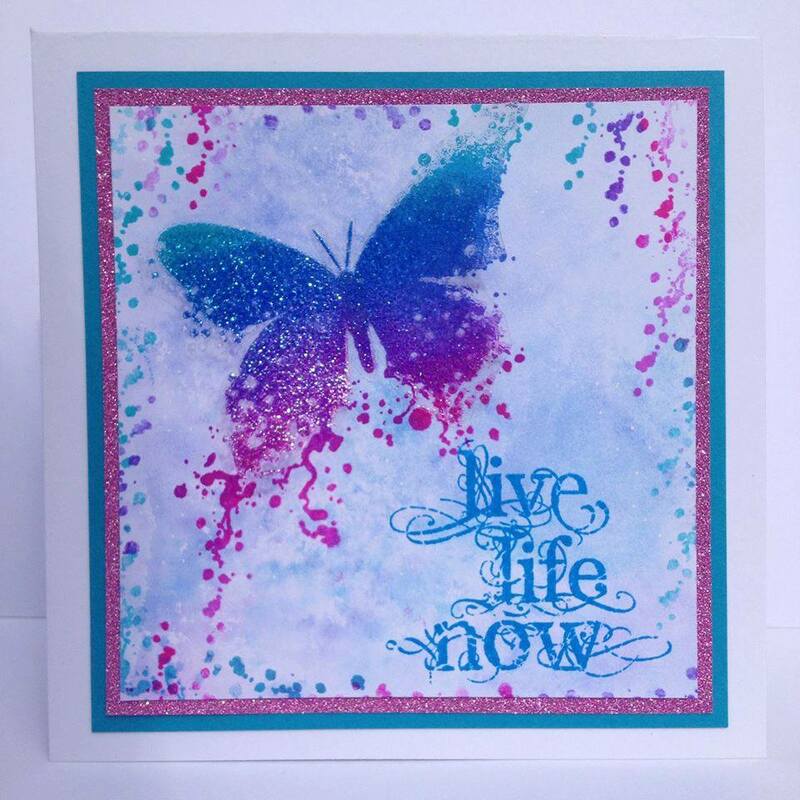 Kim has used our Large Butterfly stamp, Live Life Now sentiment and the flower from our Thank You set. 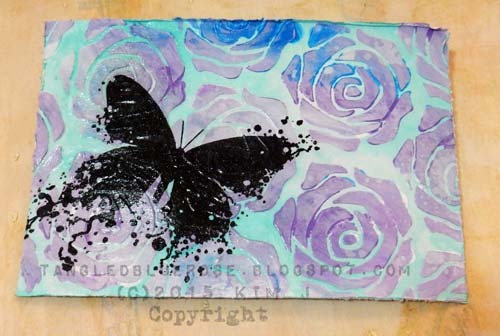 You will see that our Butterfly is definitely Kim’s favourite when you visit her blog! 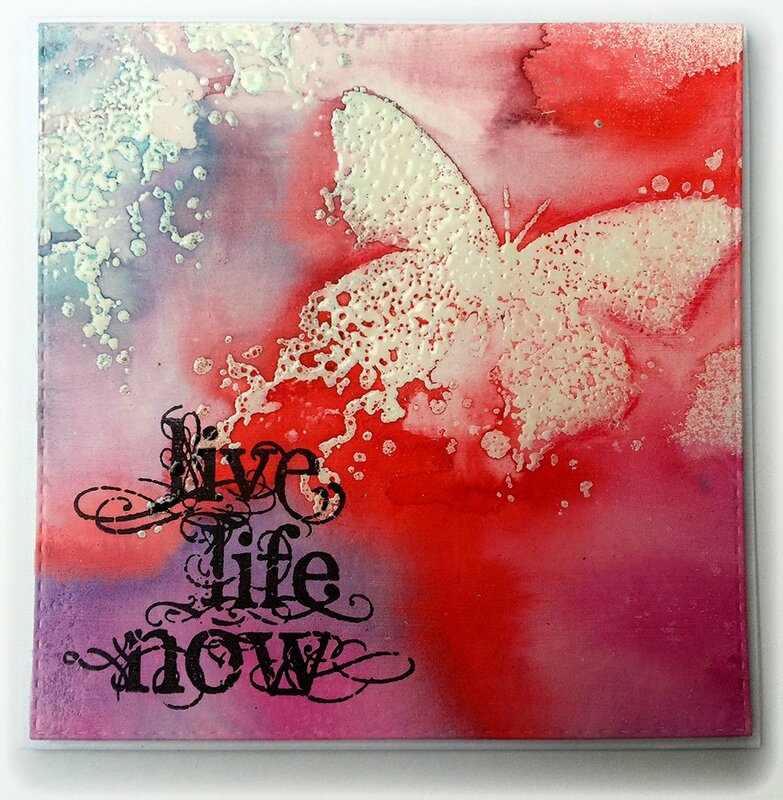 Amber has created this awesome journal with our Butterfly INKognito stamp, Live Life Now sentiment and our Music Background. Hazel has created this superb project using our Revolution Set. By visiting the DT blogs you’ll find all the details of how they created these stunning cards and projects! Our gorgeous butterflies and our stunning Revolution Set are clear favourites amongst the team! The link up tool can be found at the bottom of this post. Just tell us it’s your favourite stamp challenge entry. Please cast your vote for The British Craft Awards 2015! Are you coming to the Hobbycrafts Show at the NEC next week? If you are you MUST come and see us on STAND B26. We will have so many of our stunning stamps and we’ll have some amazing offers too! all created with Visible Image stamps! 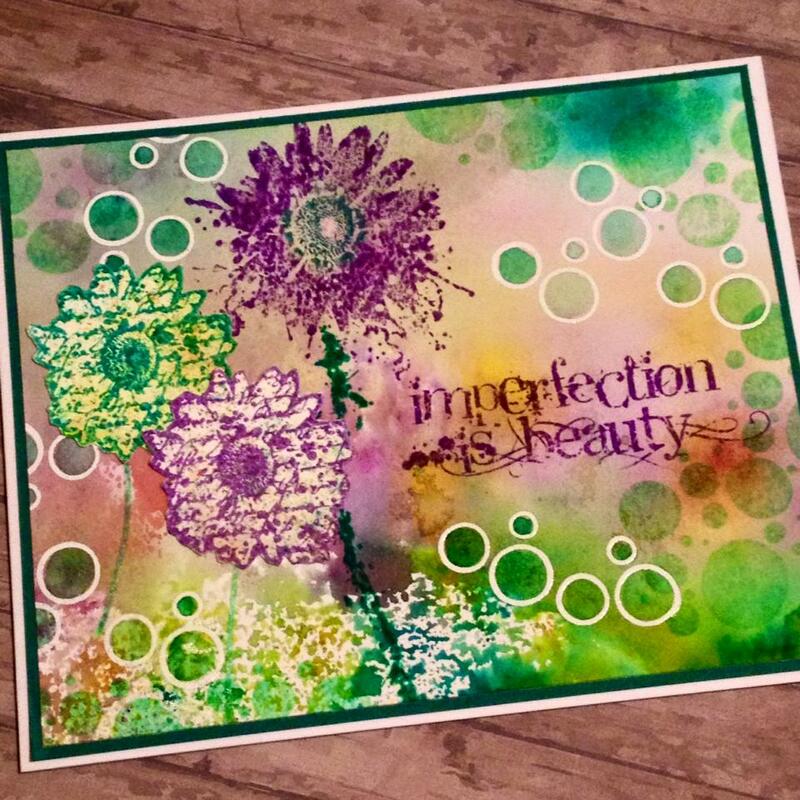 added our Imperfection is Beauty sentiment which is perfect don’t you think? and the gold looks divine! What could you create with these gorgeous stamps? the ‘Thank You’ sentiment and original verse, written by me! and fabulous Grunge Flourish stamp. wonderful to send to a friend going through a tough time. of our INKognito stamps. What could you create or alter with them? watercolour paper and distress inks. You can watch it here! What are we doing with our Sunday? Well Mark is busy designing some amazing new stamps! Would you like to be able to see our stamps up close and personal in your local craft shop? So that you can perhaps stroke them before you buy?!?!? !